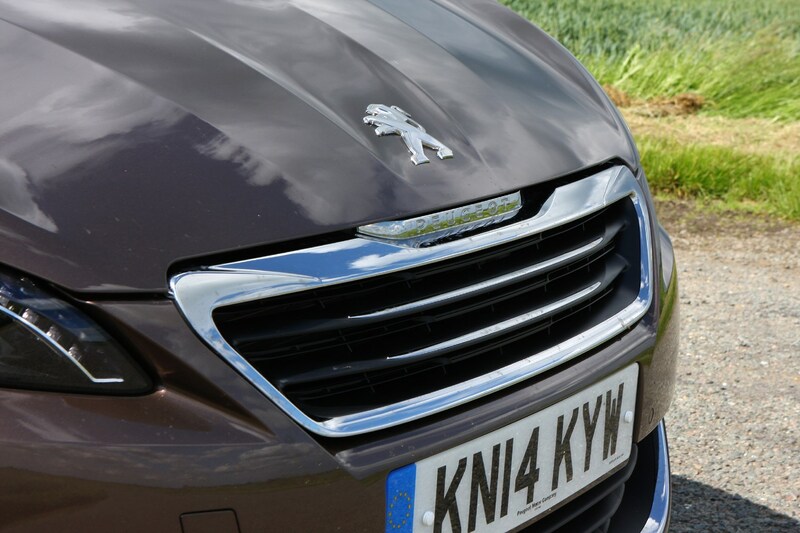 There’s a huge amount of choice here (providing you don’t want a hybrid or electric car), with four petrol and three diesel engines, ranging from 110hp to 262hp. 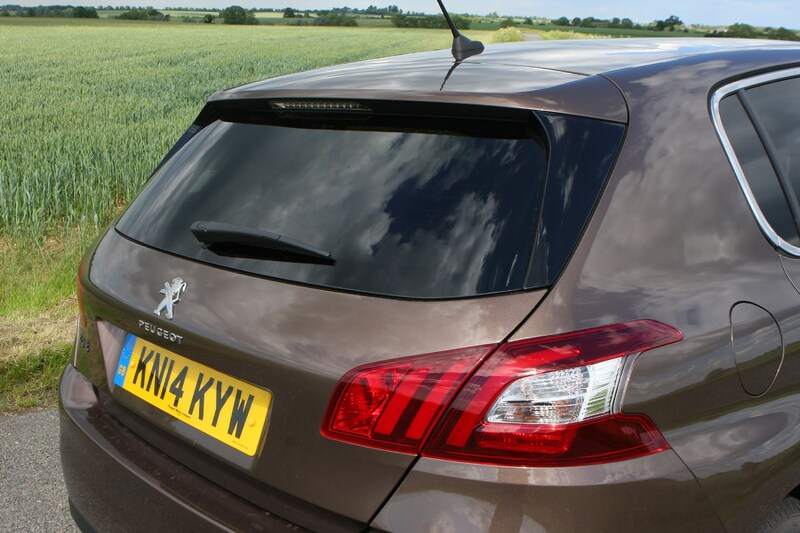 There are two power options in the mainstream range and both of them are centered around Peugeot’s fabulous 1.2-litre, three-cylinder PureTech motor. 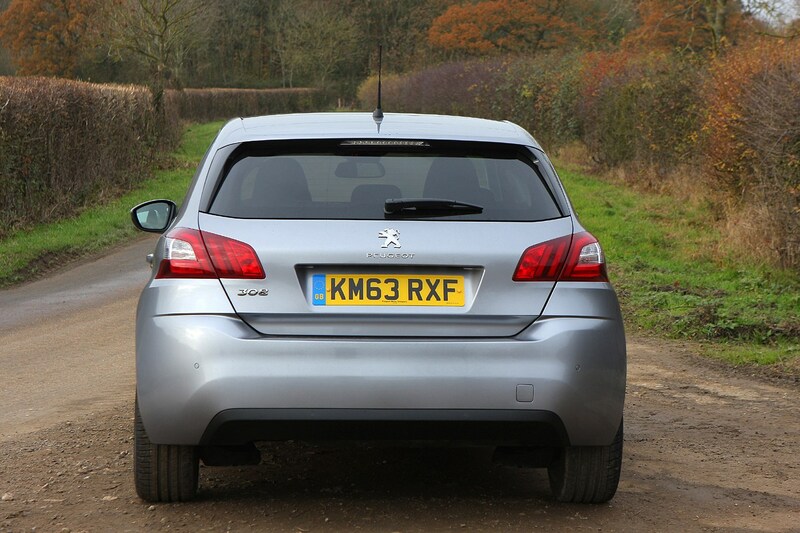 It’s one of our favourite triples on the market thanks to impressive refinement and a slightly larger displacement (many three-cylinder units are 1.0-litre), which makes it more responsive at low revs. 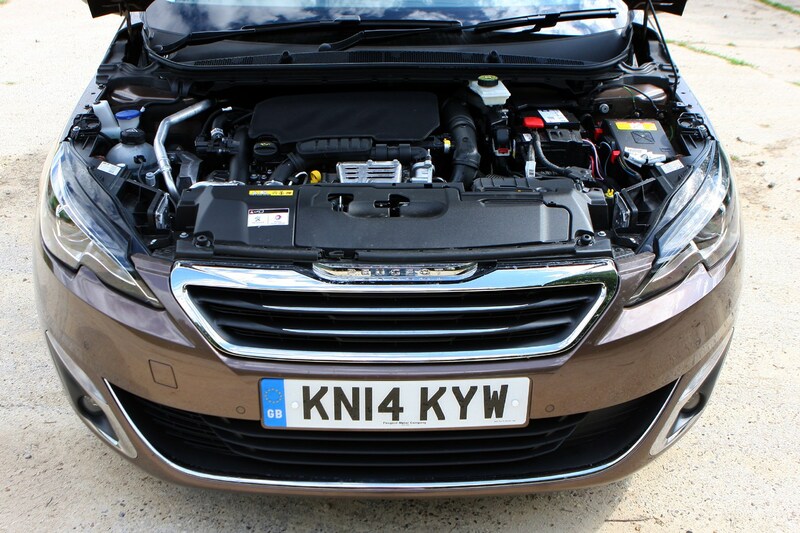 The entry-level PureTech 110 version has 110hp, 205Nm of torque and a manual gearbox, resulting in 11.1 seconds 0-62mph and a top speed of 117mph. 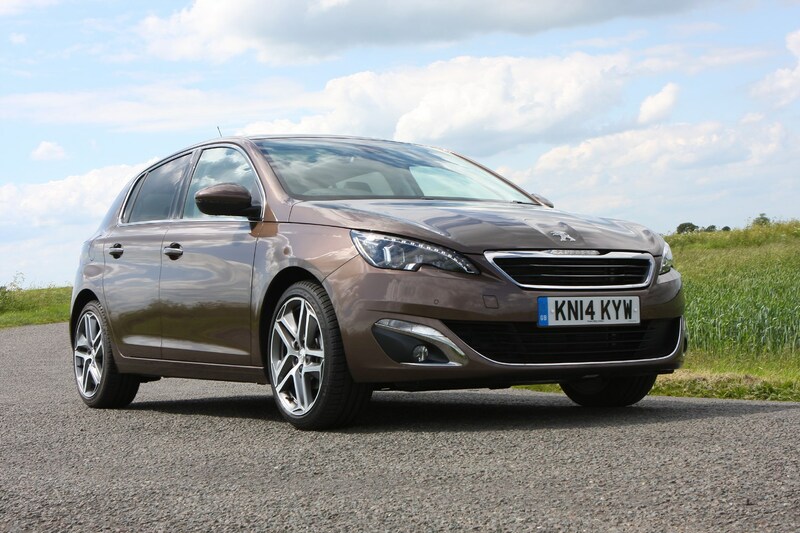 It works well in the 208 but feels a bit stretched in the larger 308, although offers almost diesel-like running costs for low-mileage motorists. 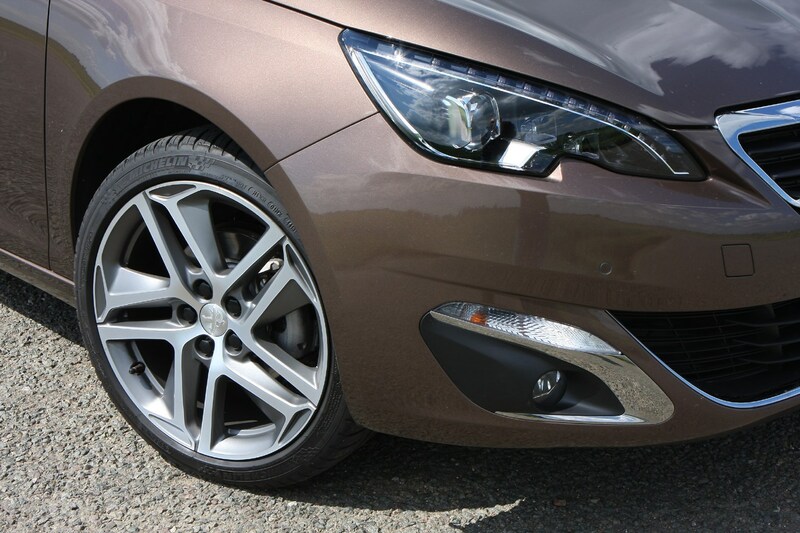 Better is the PureTech 130 version, with 131hp and 230Nm of torque for a 9.1-second 0-62mph time. 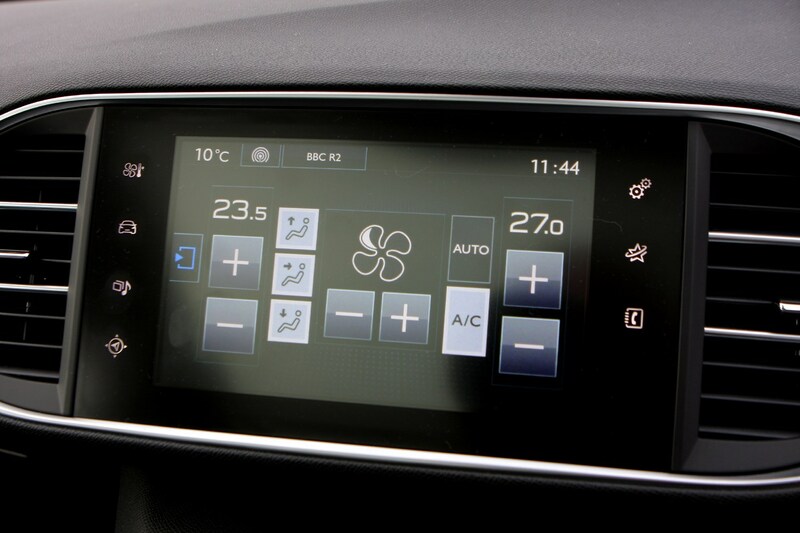 You can also select an automatic gearbox although this is about half a second slower over the benchmark sprint. Both top out at around 125mph. 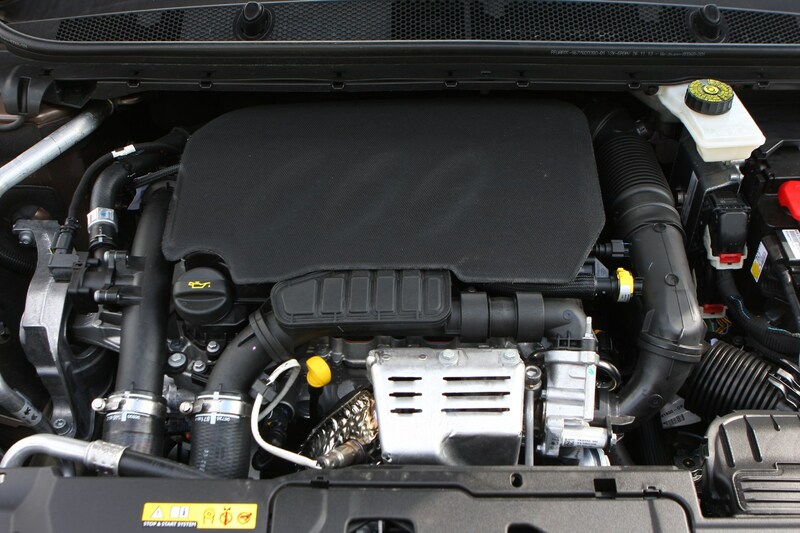 There’s more performance with the 1.6-litre THP 225 petrol with 224hp and a manual gearbox. 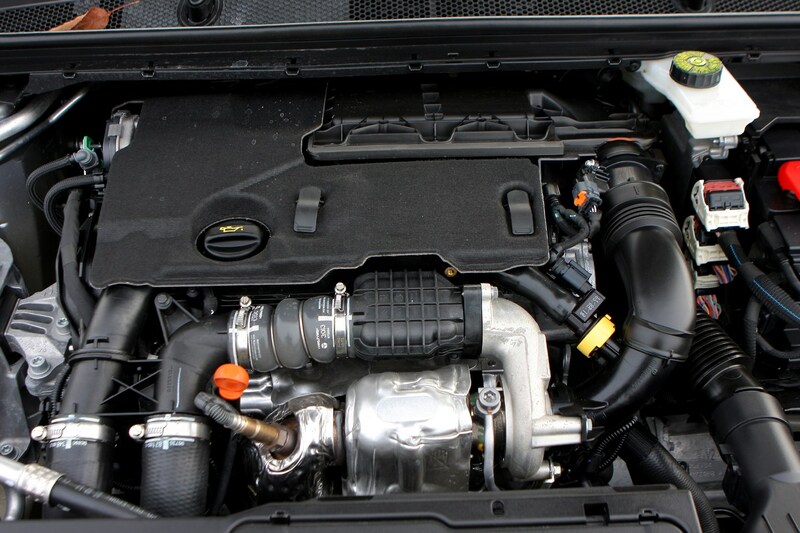 With 285Nm of torque on tap, it hits 0-62mph in 7.4 seconds and tops out at 146mph. 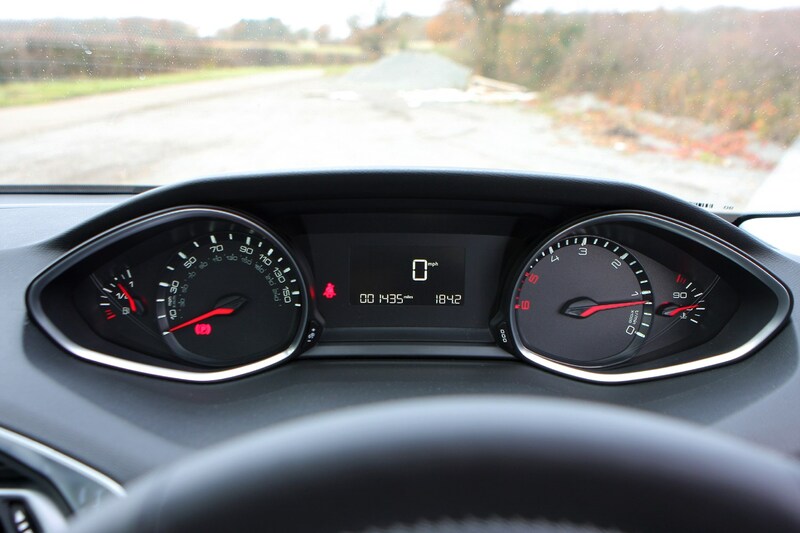 It feels as fast as these figures suggest, responding quickly and smoothly, yet quiet enough when driving normally. 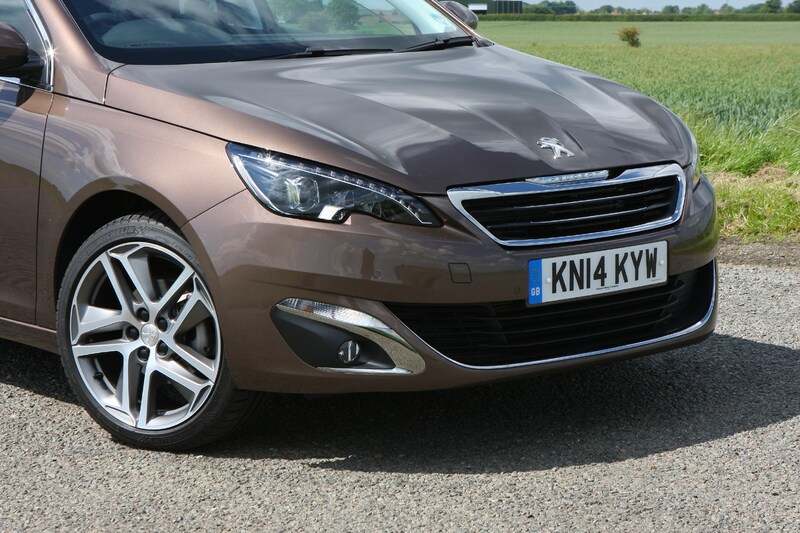 There’s more choice here largely because in 2017 Peugeot introduced a 1.5-litre BlueHDi engine that replaced the 1.6-litre motor. 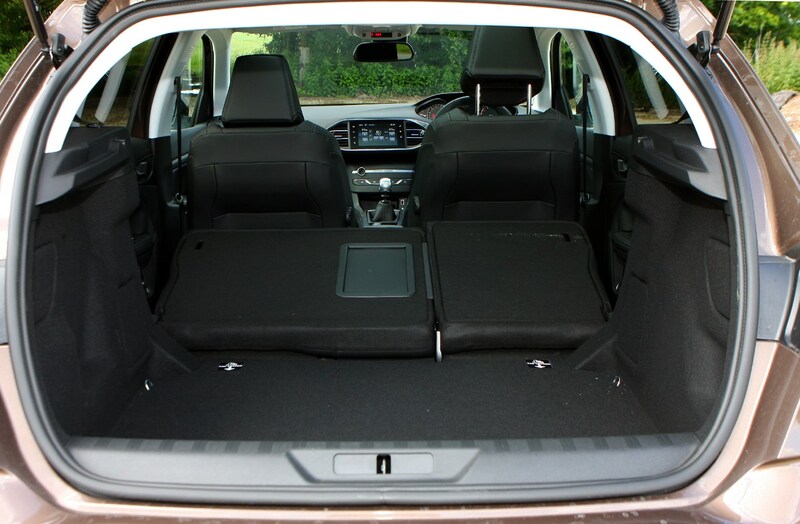 Bottom of this range is the 1.5-litre 101hp BlueHDi 100, which packs 250Nm of torque and accelerates the slowest of all options here, taking 11.5 seconds to get from 0-62mph and maxing out at 116mph. 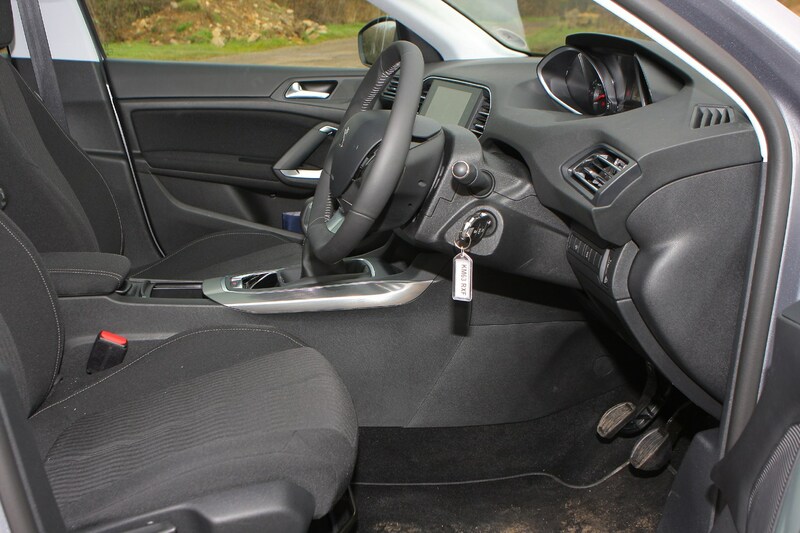 The puncher 1.5-litre BlueHDi 130 with 131hp seems a better bet, with a burlier 300Nm of torque and faster 0-62mph time – 10.2 seconds for the manual and 9.4 for the auto. 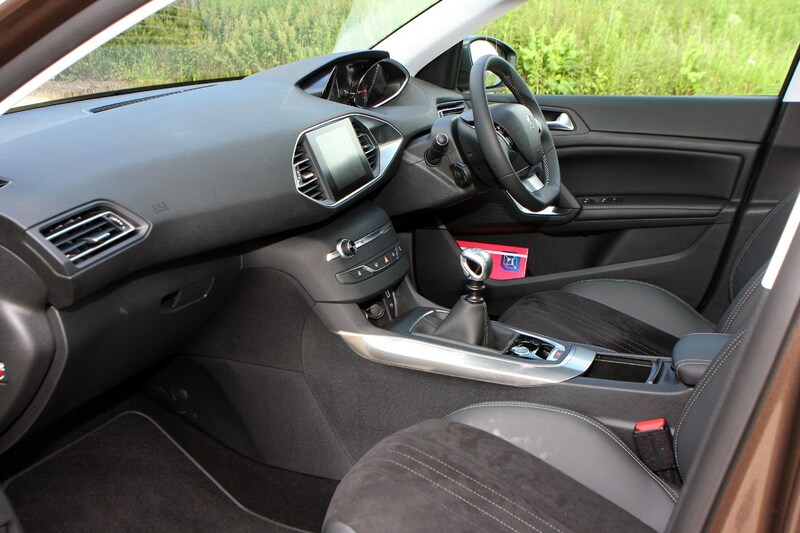 Top speed for the manual is 127mph and 128mph for the automatic. 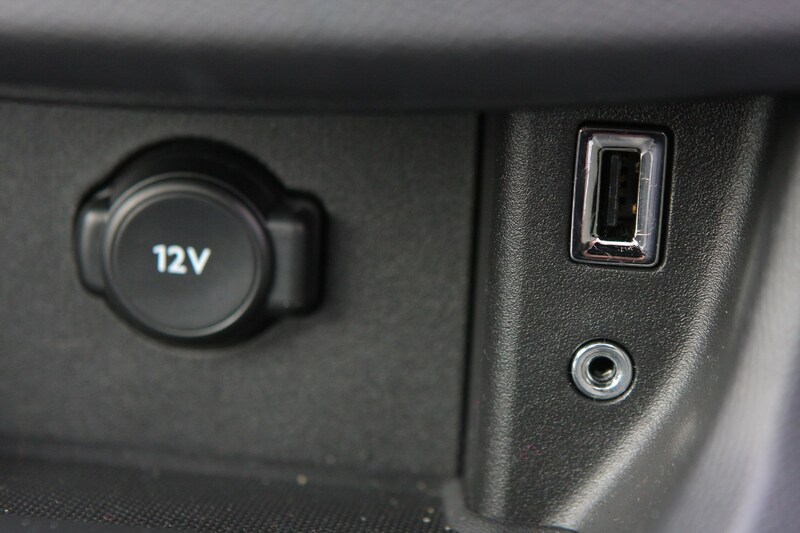 There’s a 2.0-litre BlueHDi 180 (181hp) with torque swelling to 400Nm and comes as an automatic only. There's a 140mph top speed and an 8.4-second 0-62mph time. 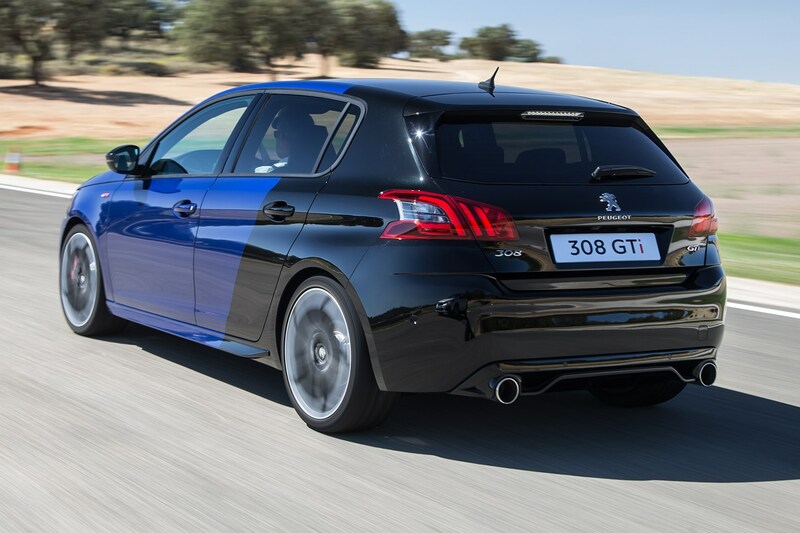 Topping the range is the 262hp GTi 260 by Peugeot Sport, which uses a more powerful version of the same 1.6-litre THP engine found in the THP 225. 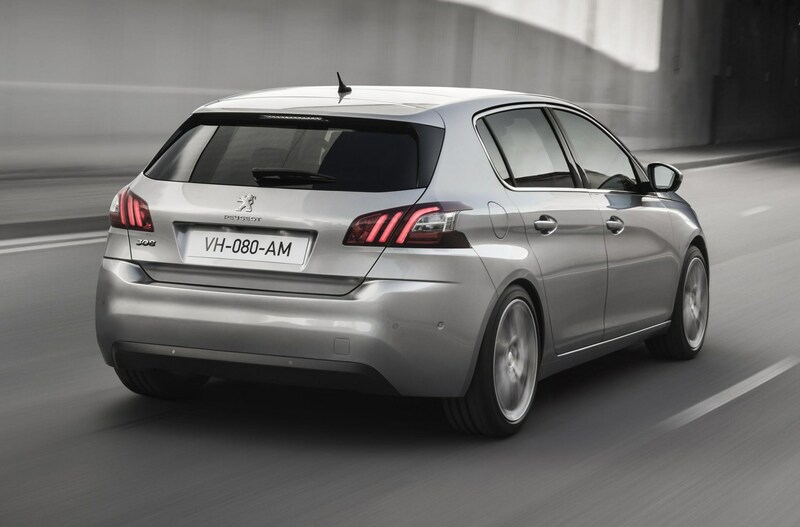 Peak torque of 340Nm is available from 2,100rpm, allowing this 308 to sprint from 0-62mph in just 6.0 seconds, progressing on to a top speed of 155mph. 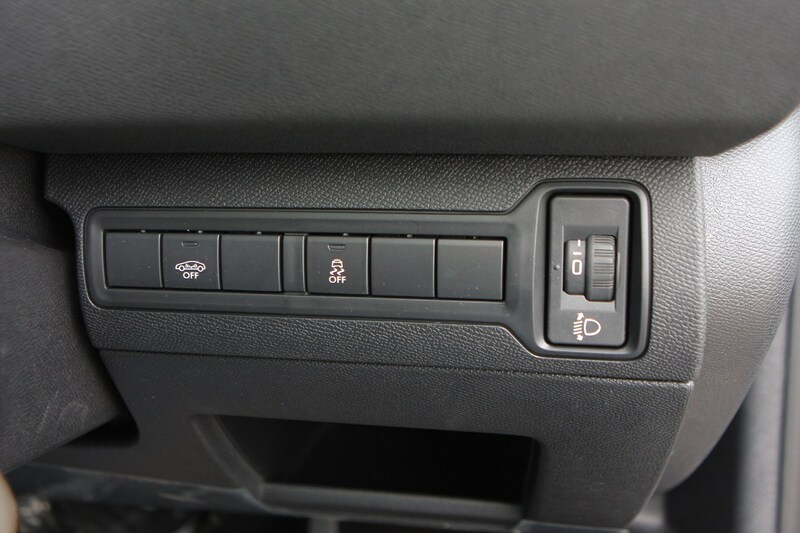 The GTi’s throttle response can be sharpened further by pressing the Sport button near the gearlever – GT versions have this feature as well, although the affect is less noticeable. 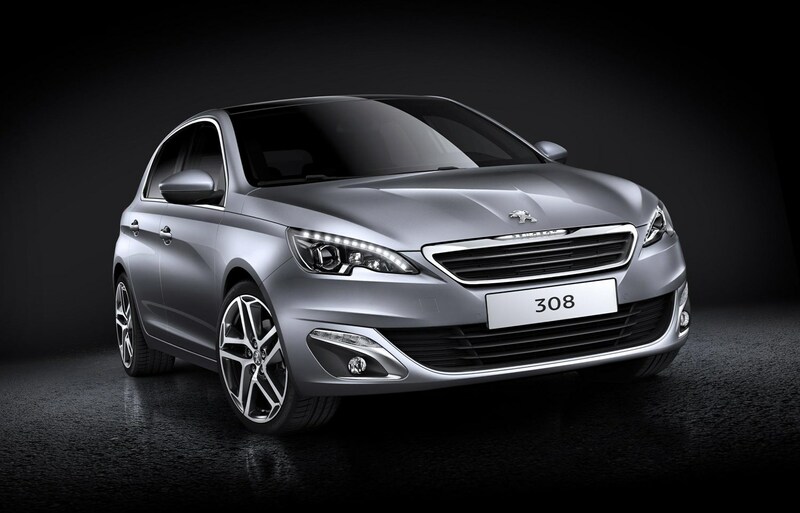 No surprise to find that the 308’s available with both manual and automatic gearboxes. 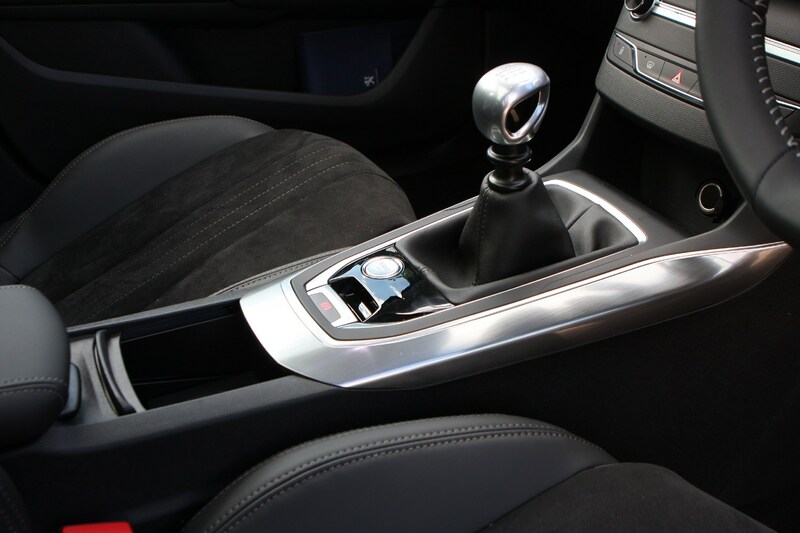 All models come with a six-speed manual and while it’s an easy thing to use, it doesn’t set any benchmarks in terms of precision or enjoyment. 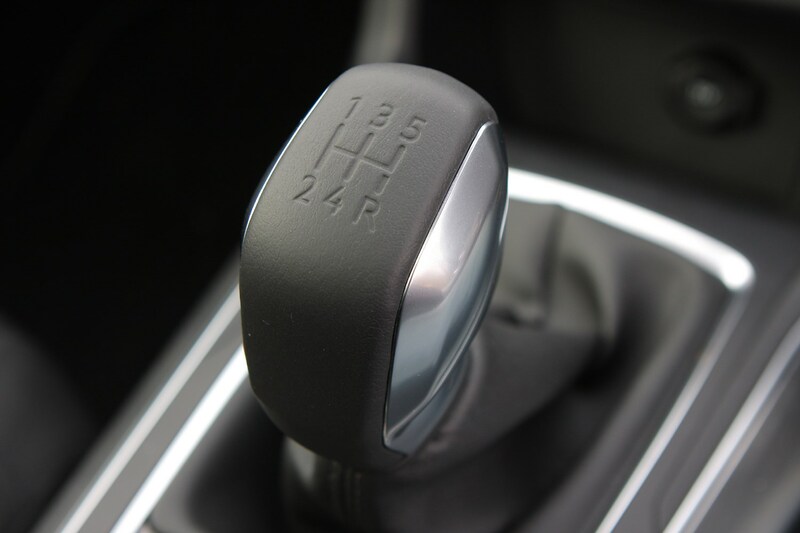 The shift action is a bit notchy and the lever’s movement into each gear can feel a bit vague, but it certainly does the job. 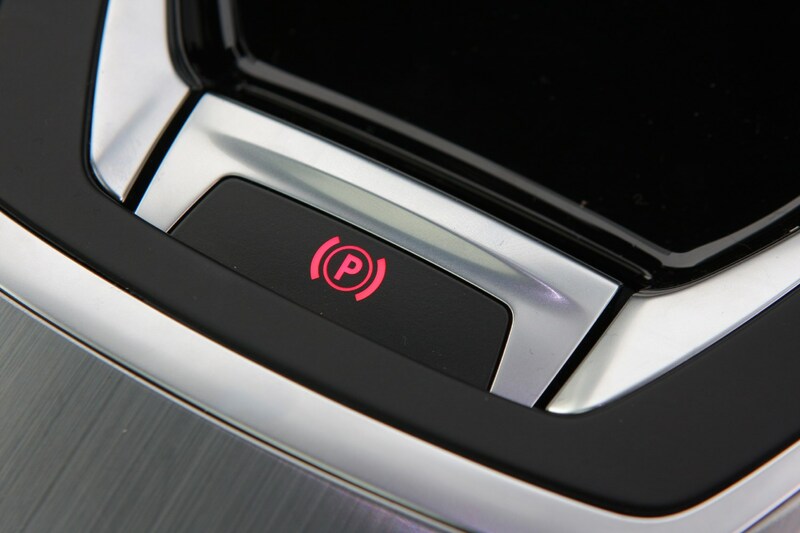 An eight-speed automatic, introduced in 2017, is much better than the previous six-speed option available, but is limited to the higher-powered engines. 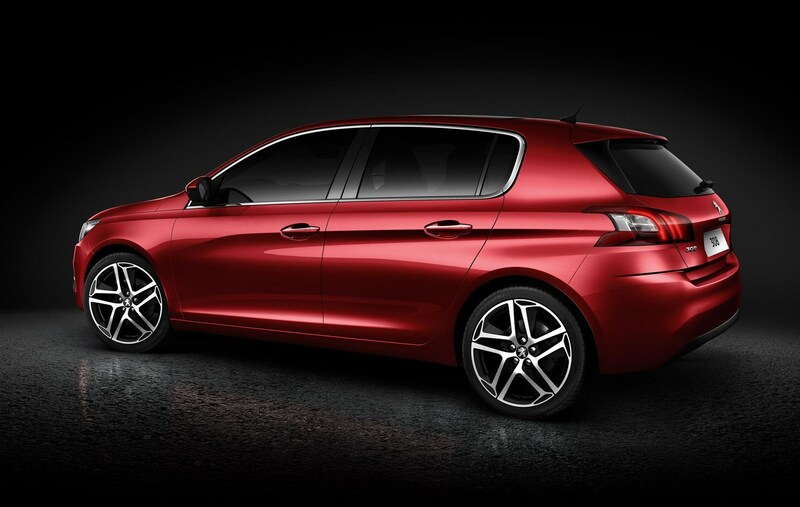 The Peugeot 308 GTi goes one better than the Volkswagen Golf GTI, because it also has a Torsen limited-slip differential that sends torque to the front wheel with the most traction to pull you out of corners, powerful 380mm Alcon front brake discs that offer strong retardation, and sticky 19-inch Michelin Pilot Super Sport tyres. 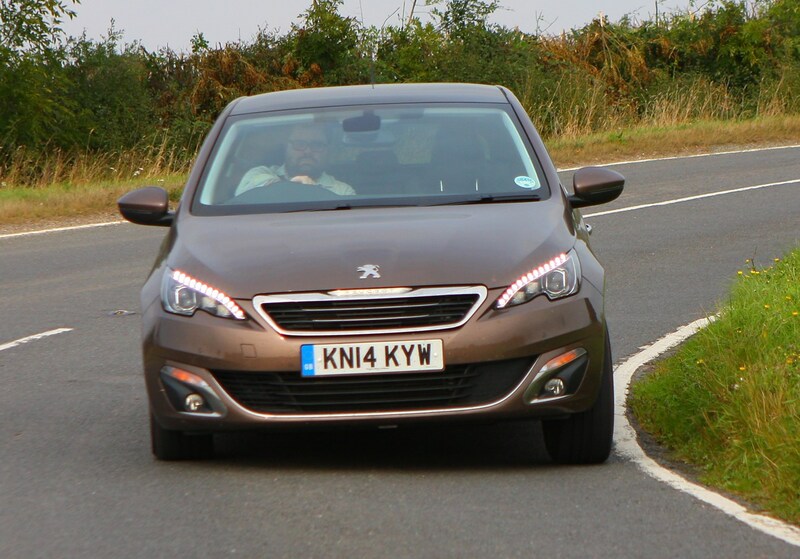 The differential works incredibly well in corners, but on a damp road you can find the steering wheel tugging left and right under acceleration. 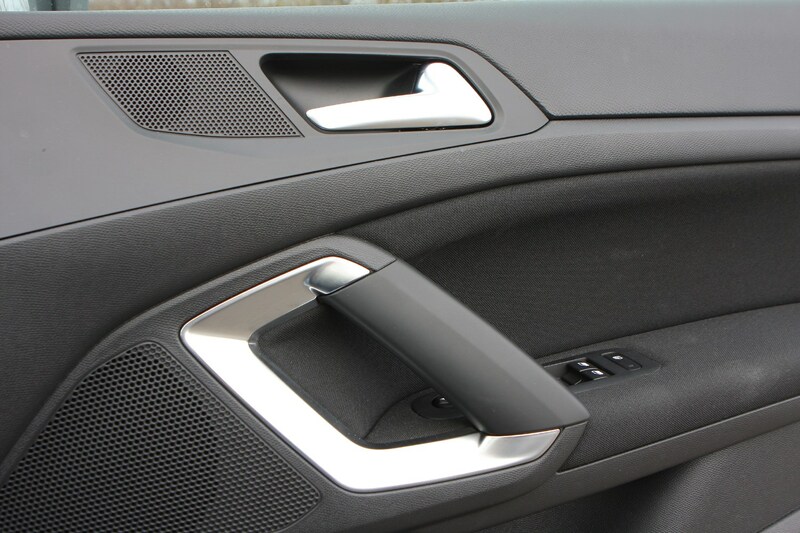 This coupled with the small steering wheel means you end up having to work quite hard to keep it going in a straight line. 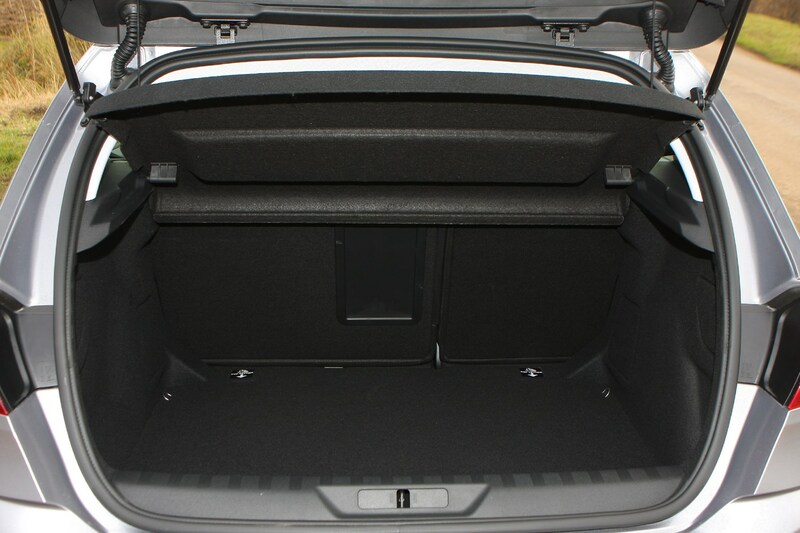 A Golf GTI with the Performance pack, which adds a similar differential along with power and brake improvements atop the standard car, manages the transition between softer road-going family vehicle and screaming hot hatch far better. 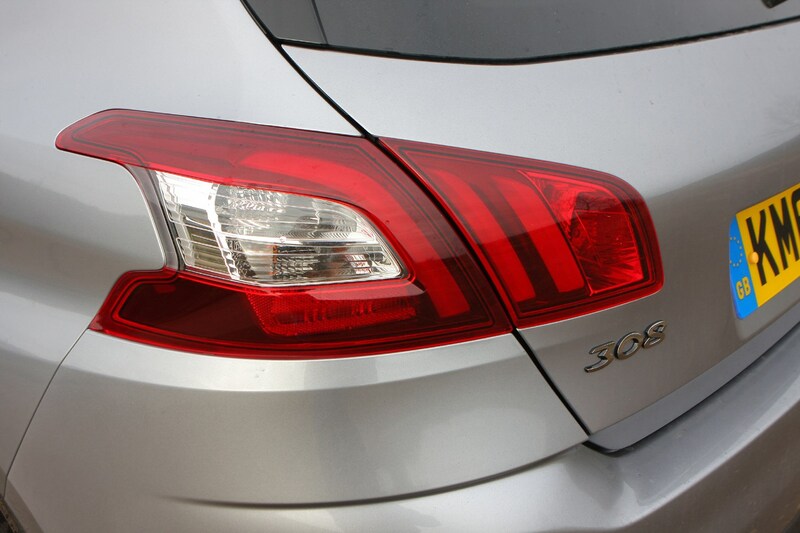 The 308's mechanical parts haven't changed during the facelift, though. 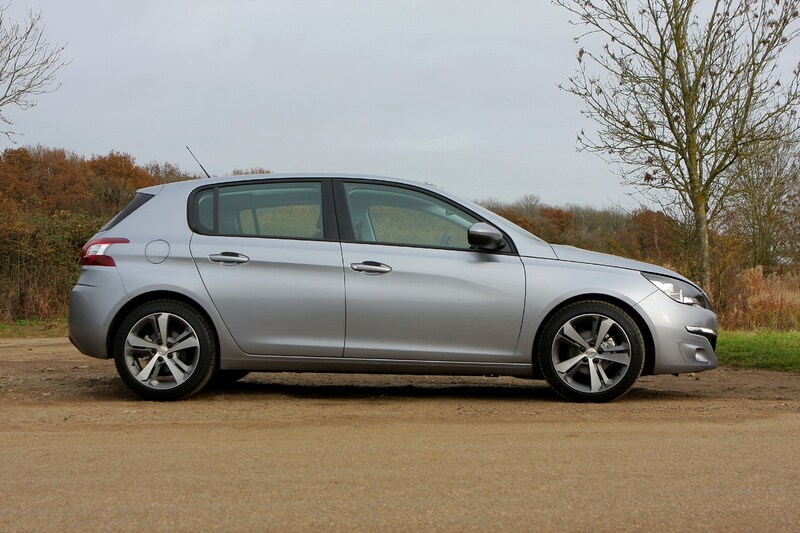 On the move, the PureTech 130 three-cylinder petrol engine is as lively as ever, and is much more refined in the 308 than in something like a DS 3 or Citroen C3. 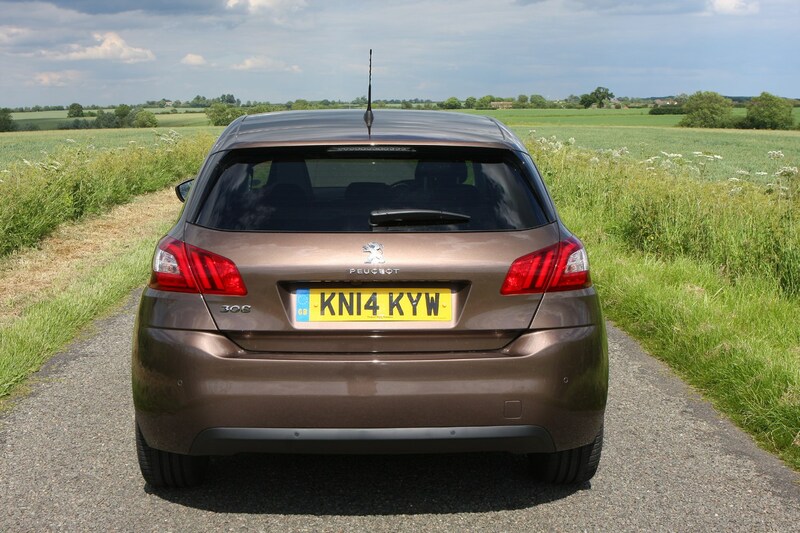 It’s a relaxed motorway cruiser, but the fun factor is a bit limited due to a very vague-feeling manual gearbox that responds better to slow, considered gearchanges than speedy ones. 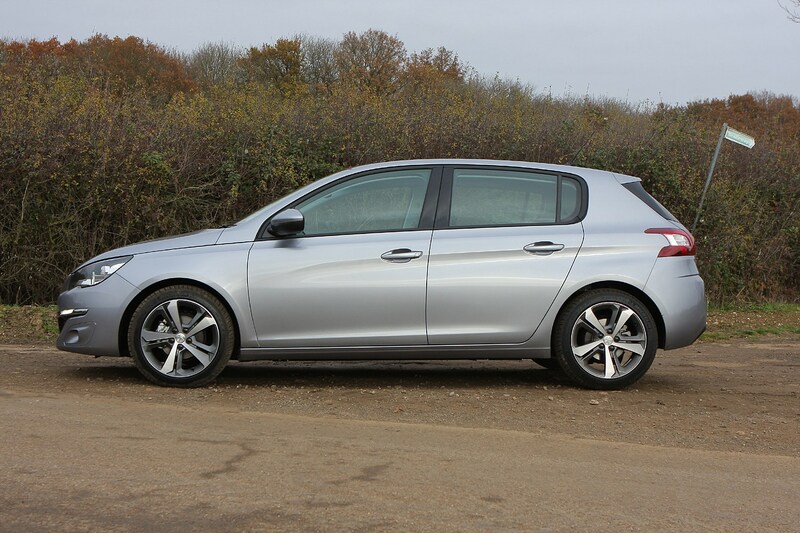 That’s a shame as the 308 handles quite well, although the ride on larger wheels can feel unsettled, with larger bumps in the road really upsetting the car’s composure. 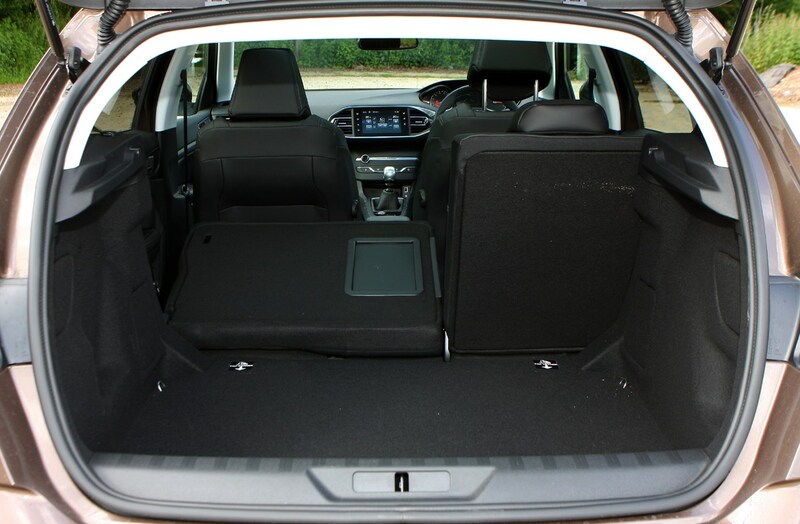 For most though, it’s a balanced set-up, but isn’t as well-rounded as a VW Golf or Hyundai i30 when it comes to comfort and handling. 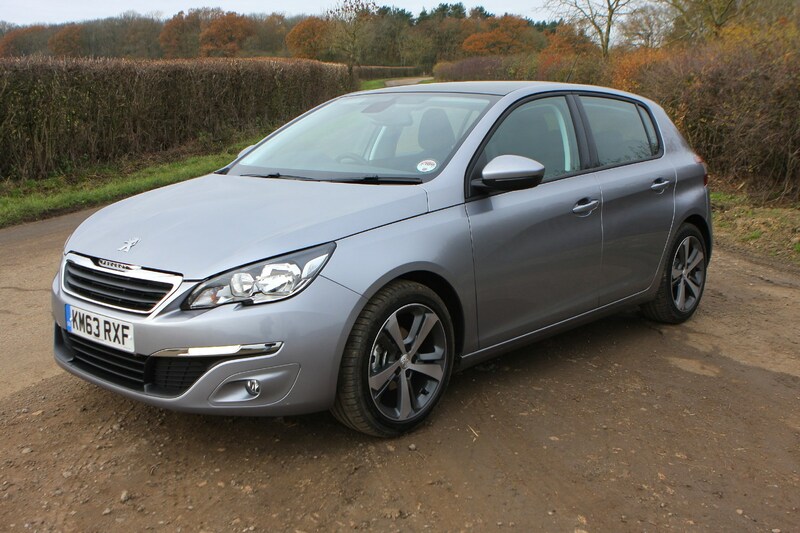 It would be easy to discount the Peugeot 308 GT Line as a bit of a halfway house, a warm-hatch that is neither fast nor dazzlingly frugal. 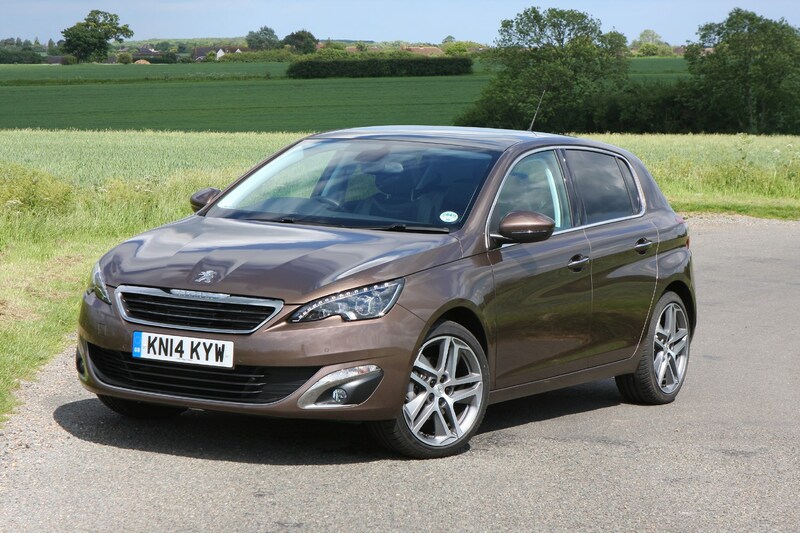 However, thanks to a clever engine that promises big thrills and small bills, plus a substantial saving over the hotter 308 GT, we think it could just be the hidden gem of the range. 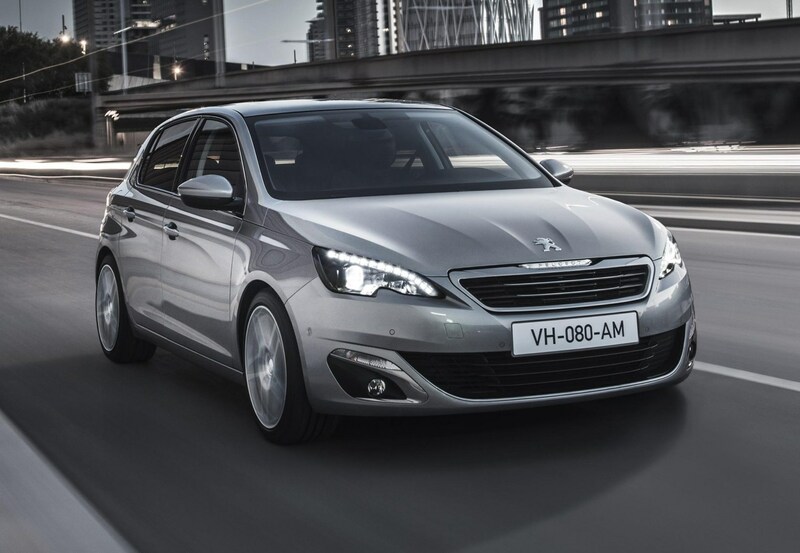 Peugeot’s 1.2-litre petrol engine promises the power of a traditional 1.6-litre unit with much better fuel economy – a claimed 58.9mpg – thanks to its three cylinders and turbocharger. 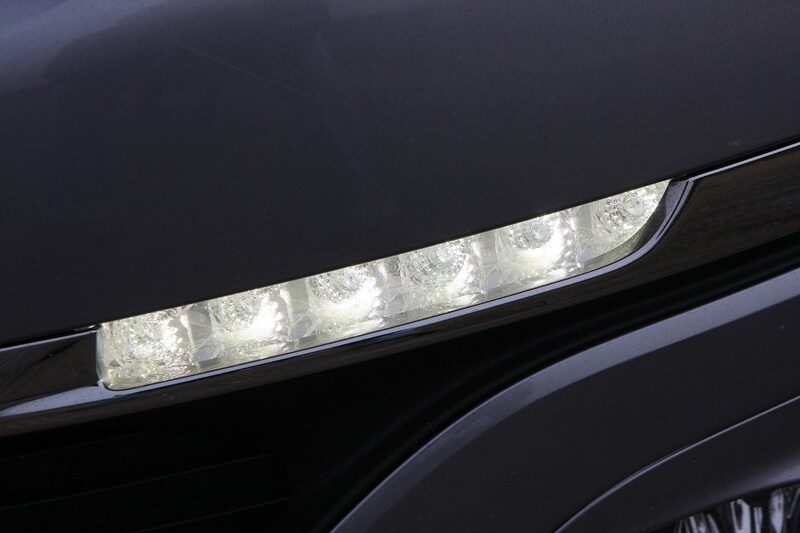 You can have it with 110hp or 130hp, and we’ve got the more powerful version on test. 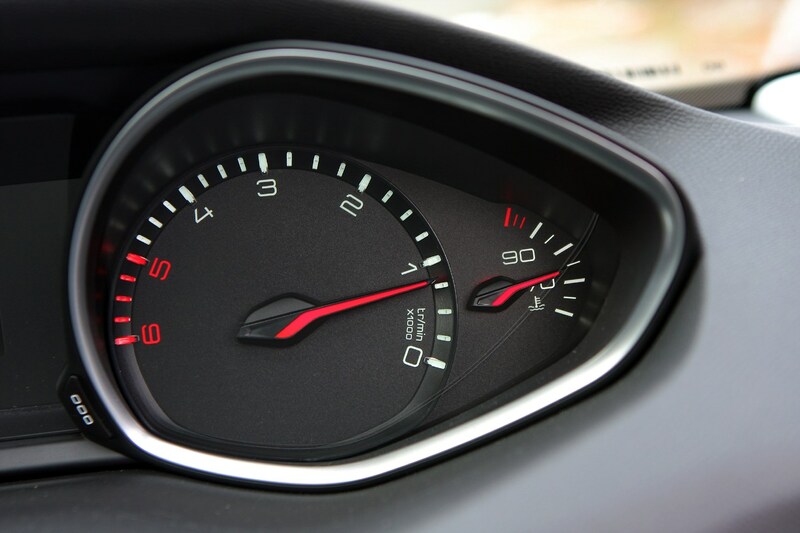 Sprinting from 0-62mph takes 10.3 seconds, but in practice it feels faster as 95% of its torque (230Nm) is available between 1,500 and 3,500rpm. 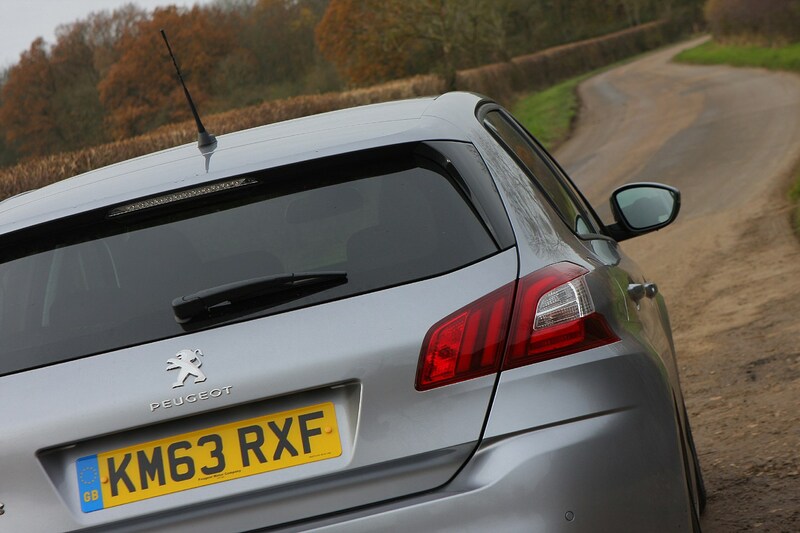 The engine in our car felt more characterful and rewarding on a windy road than the fuller-fat GT. 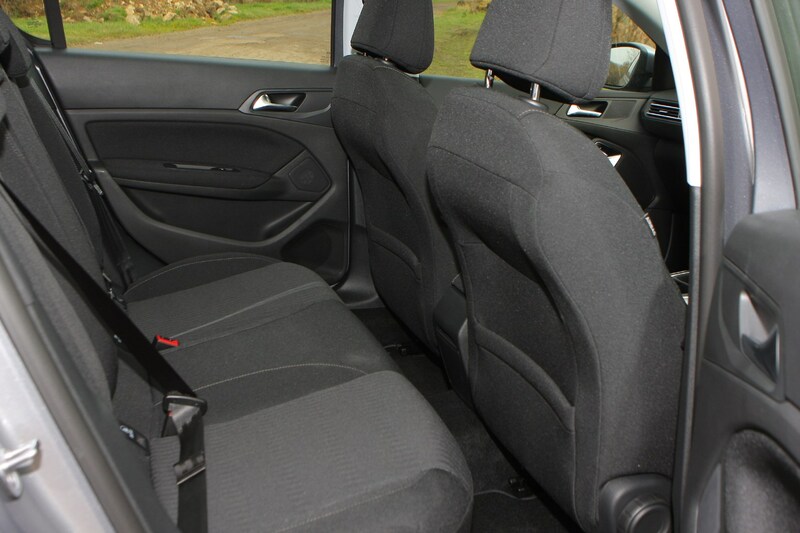 It needs to be kept on the boil with lots of gear changes but is a more involving experience for it. 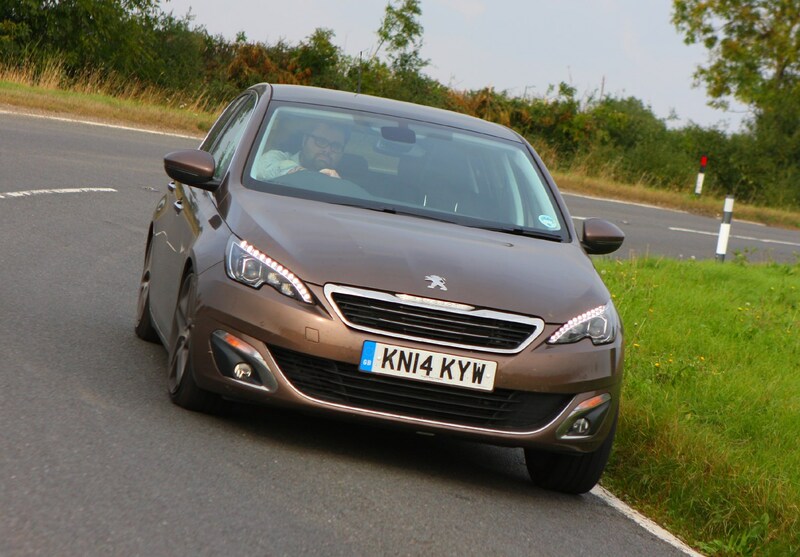 There’s lots of grip from the big wheels and an overwhelming feeling that you’re going a lot faster than you should in a car with a 1.2-litre engine. 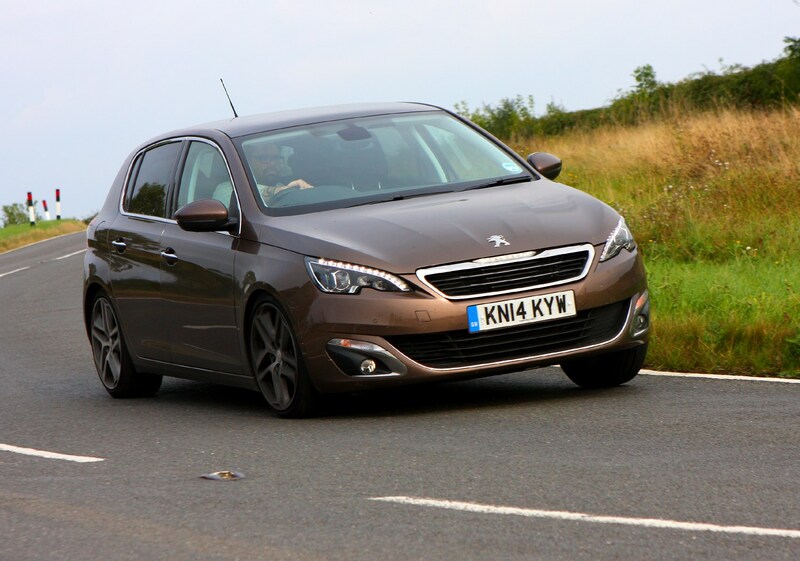 In many ways the GT Line car makes more sense than the more expensive 308 GT, particularly to fleet drivers. 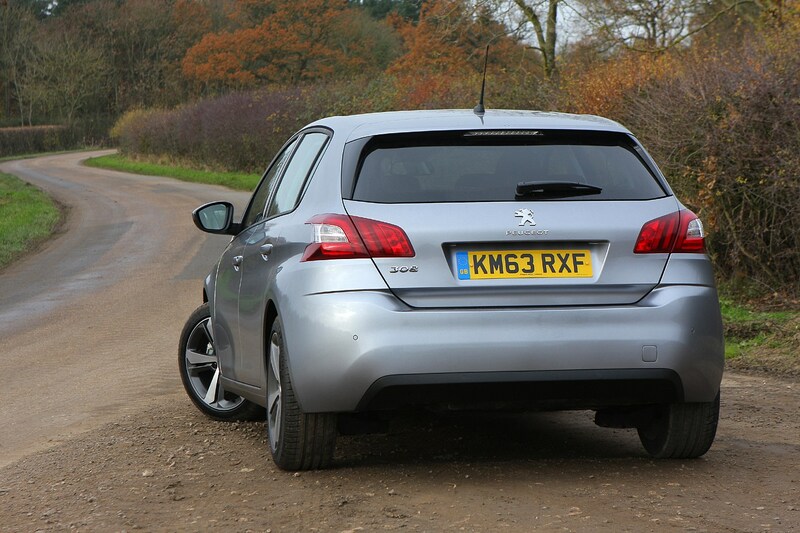 It’s cheaper to buy, and its excellent engine means you can have 90% as much fun without the associated costs. 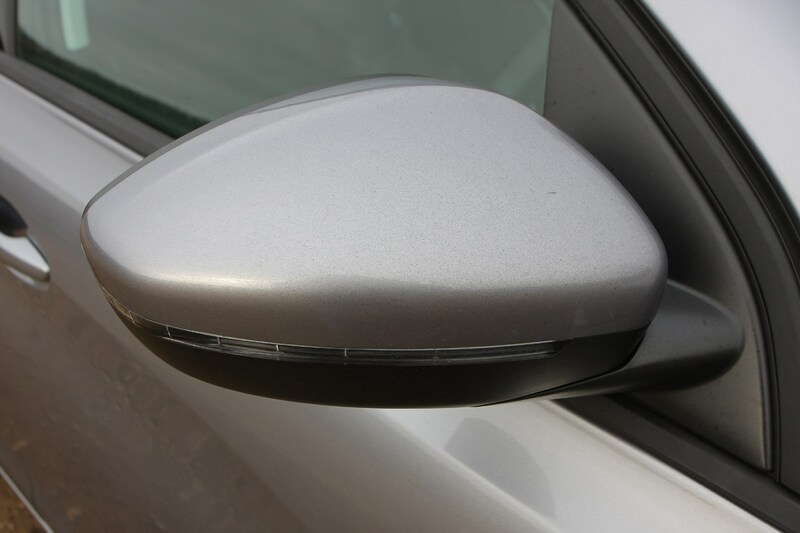 Plus, you can spec it up to the point where it looks and feels almost exactly the same as its bigger brother, and still save money. 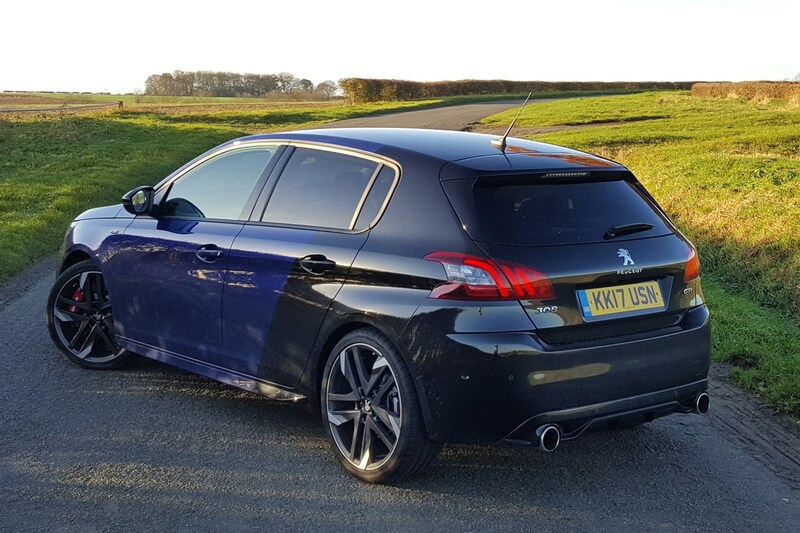 French manufacturers know a thing or two about how to make an appealing hot hatchback so provenance alone bodes well for the 308 GT, especially following the firm’s return to form with the 208 GTi 30th Anniversary and RCZ-R.
Appetites are further whetted by the turbocharged 1.6-litre, 205hp engine nestled under the bonnet and complementary visual makeover. 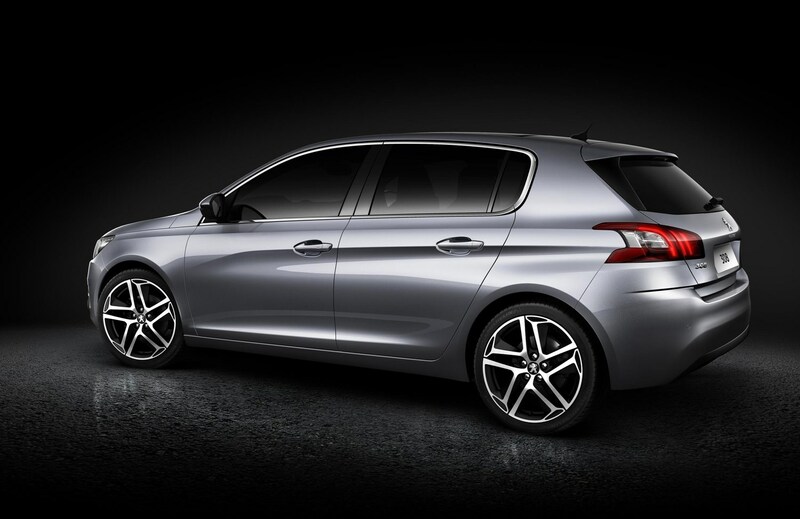 Transforming the handsome but humble 308 hatchback into sportier GT form is a subtle undertaking – there are no outrageous spoilers or two-tone Coupe Franche paint job, as offered on the 30th Anniversary 208 GTi. 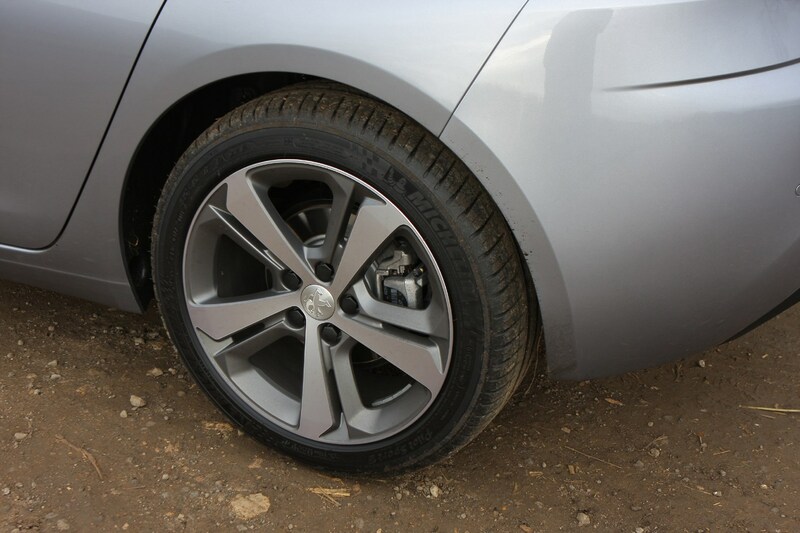 Instead the ride height’s been slightly lowered, the 18-inch alloy wheels are of a design unique to the GT and there are side sill extensions visually linking the front and rear rims. 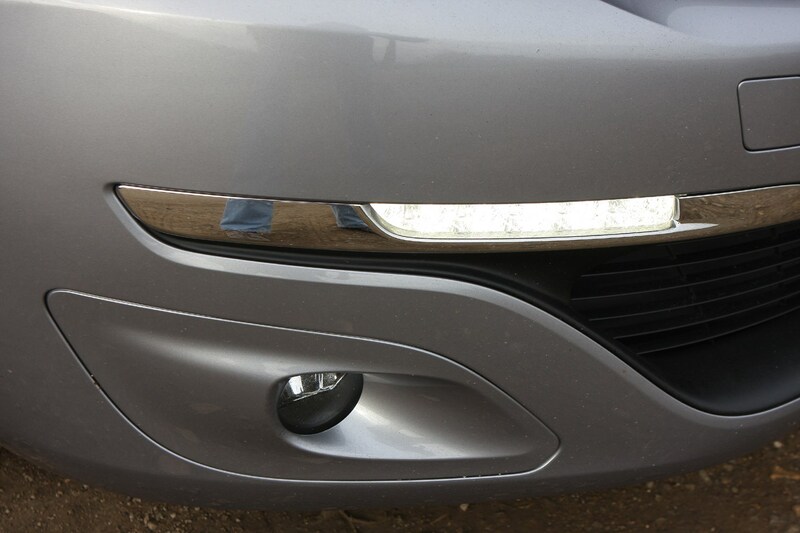 Elsewhere the lion logo moves from the bonnet to the grille, the front indicators are the pulsing LED variety and at the back there’s a glossy black applique to the lower bumper with fake exhaust exits at either side. 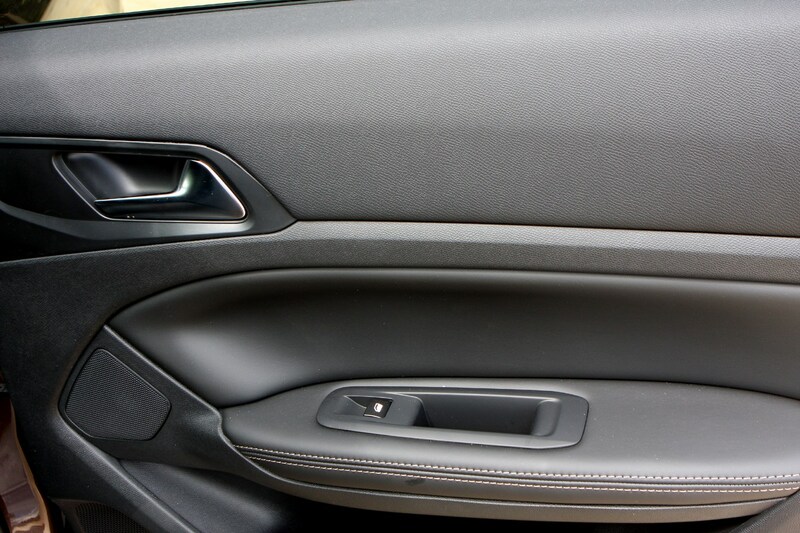 Inside the changes are equally restrained, with scarlet stitching to the seats and trims and a Sport button behind the gearlever – press it and among other changes the instrument backlighting flicks from white to red. 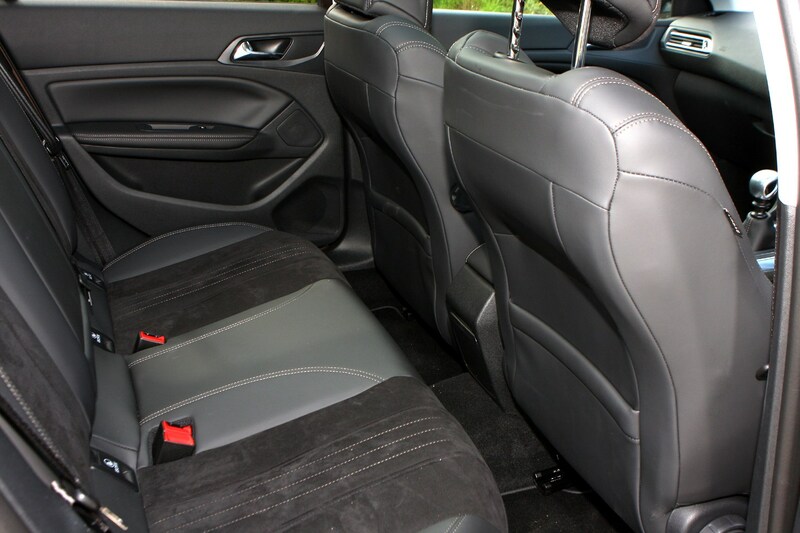 For your £24,095 outlay you’re treated to massaging front seats, privacy glass and adaptive cruise control as highlights of its generous equipment roster, although our test car was additionally specced with a handful of options. 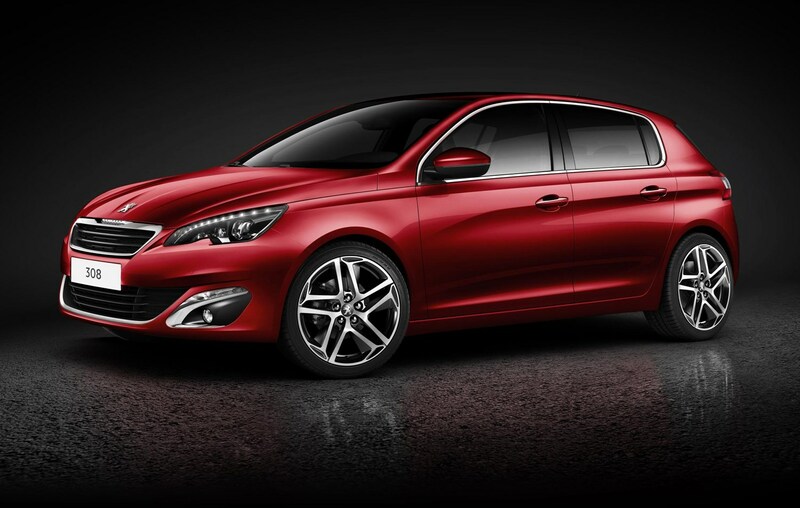 That THP turbo engine delivers the requisite briskness buyers expect from hotter hatchbacks, propelling the 308 GT up to 146mph. 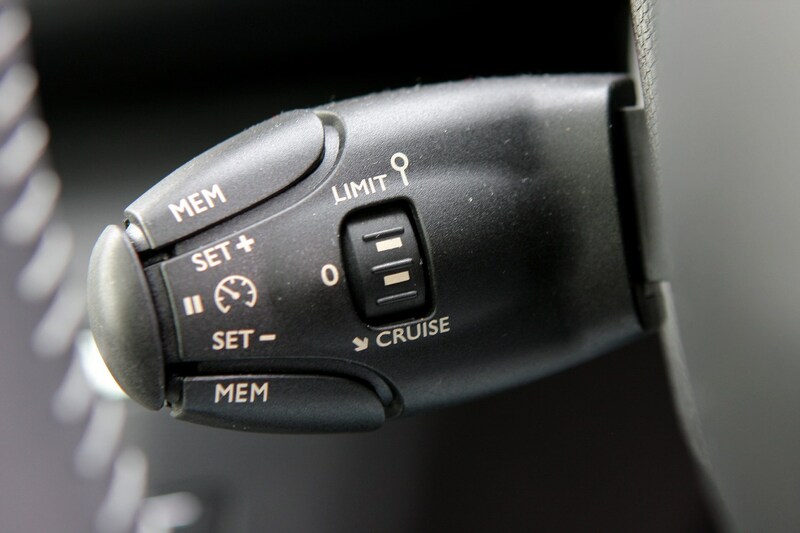 It’s a torquey motor too, with 285Nm available from just 1,750rpm, ensuring overtaking manoeuvres are quickly and safely dispatched; the sprint from 0-62mph takes 7.5 seconds. 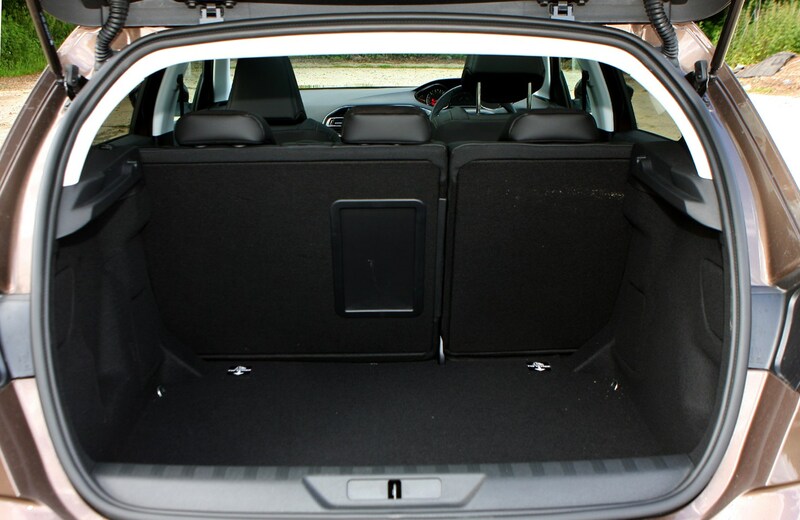 What’s conspicuous by its absence is much in the way of aural drama – it doesn’t sound like a car that’s trying to excite you. 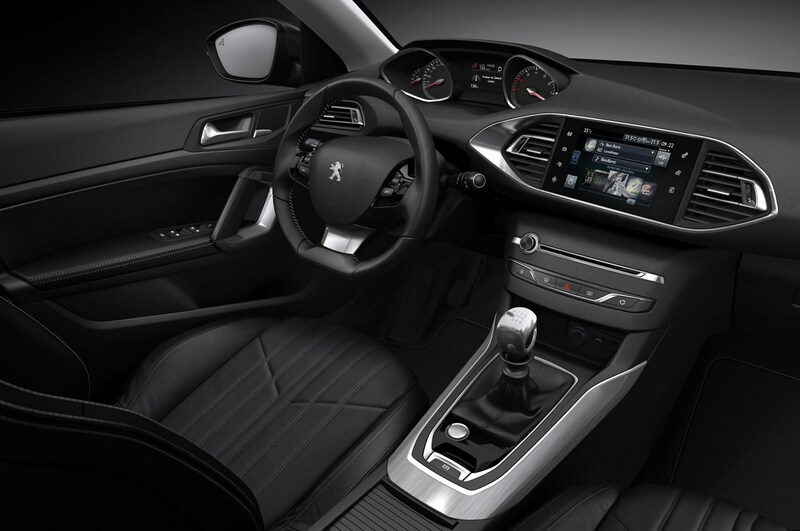 Peugeot offers a remedy by synthesising an engine noise through the GT’s speakers in Sport mode – the problem is it sounds too fake, as though you're listening to a sports car on the radio. 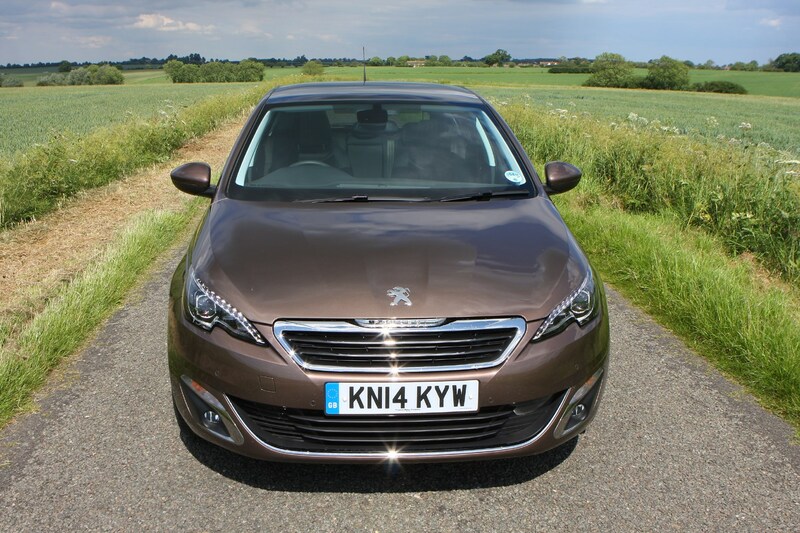 If based on the 308 GT’s subdued appearance and swift but undramatic performance you’re hoping the Peugeot will redeem itself with wonderfully engaging handling characteristics then you’re likely to be disappointed. 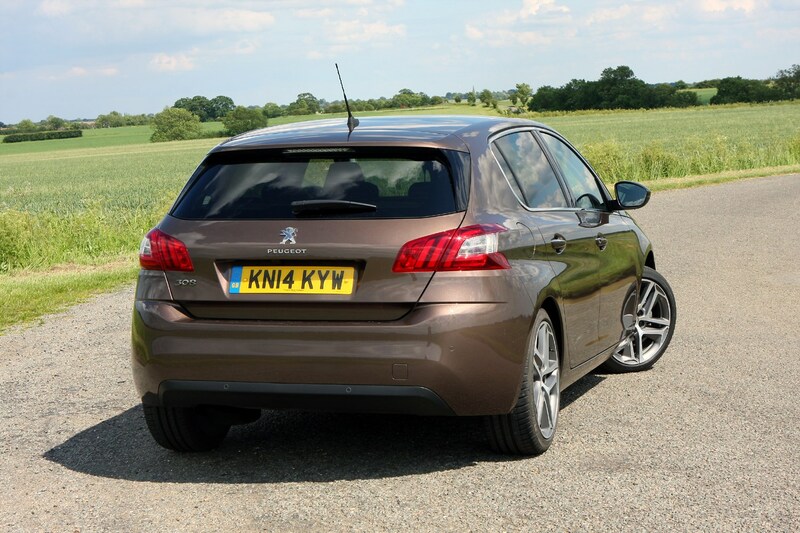 Positively, the 308 GT rides surprisingly comfortably given the larger wheels combined with lowered, stiffened suspension; you won’t get on first name terms with your chiropractor if you choose one as it soaks up sharper ruts and elongated ripples with ease. 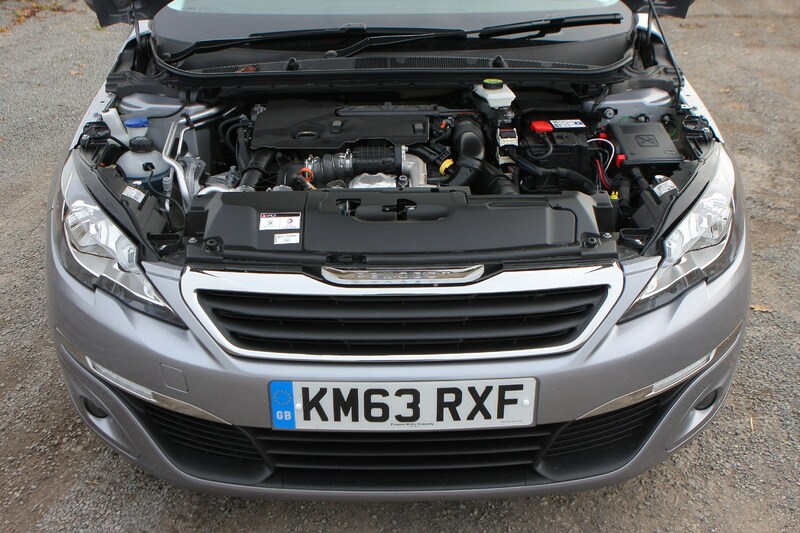 The 1.6-litre THP petrol engine was previously sold in 125hp and 155hp guises. 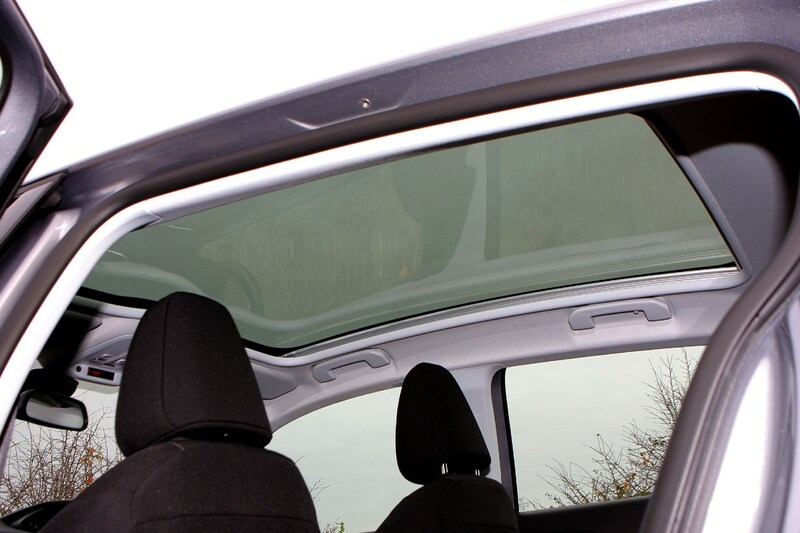 The more powerful petrol is nippy around town, easily able to cruise on motorways and keeps up with the faster-moving traffic without difficulty. On more twisty back roads we needed to change gear more frequently to keep the engine in its torquier power band, though. 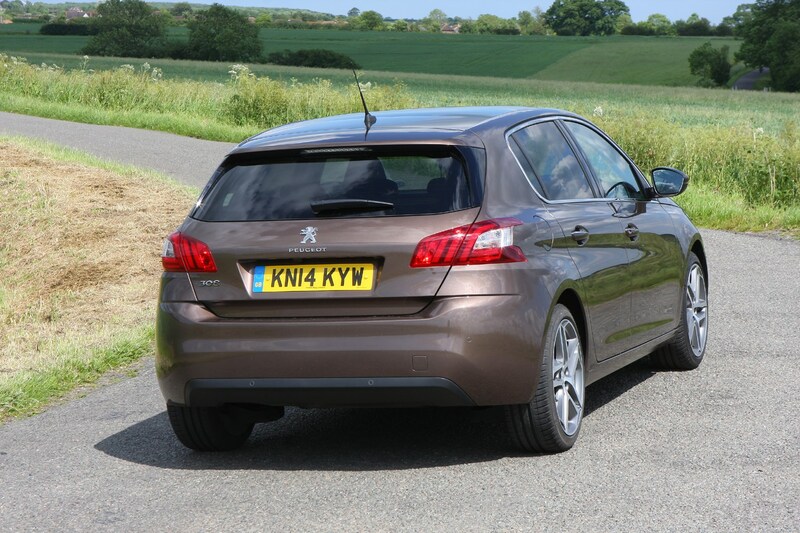 A 1.6-litre e-HDi diesel with 115hp was also sold – this doesn’t offer a huge amount of punch low down in the rev range, but builds quickly to provide good overtaking ability and high speed cruising. 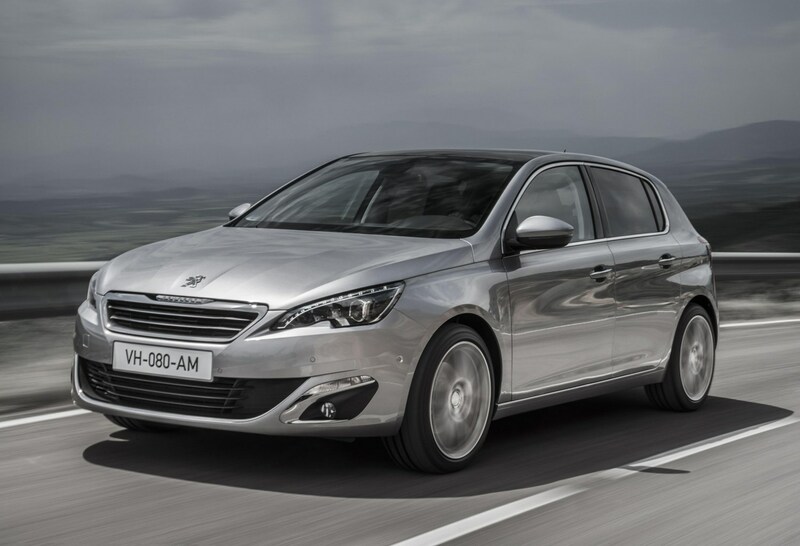 All 308s have enjoyed a 140kg weight-saving over the previous-generation model meaning the familiar 115hp 1.6-litre e-HDi engine enjoys an economy boost with claimed efficiency figures of 78.5mpg and CO2 emissions of 95g/km. 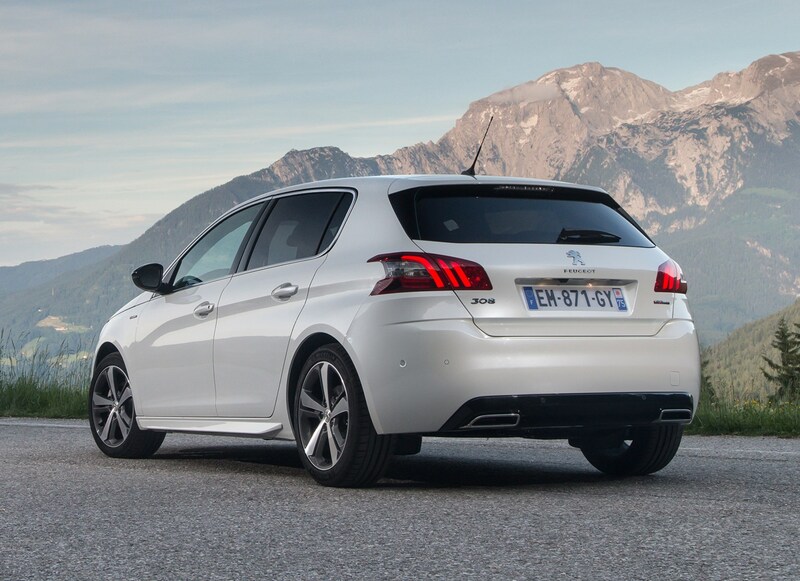 Peugeot also initially offered the 308 GTi with 250hp but this version was dropped in order to focus on the more successful 272hp car from 2017. 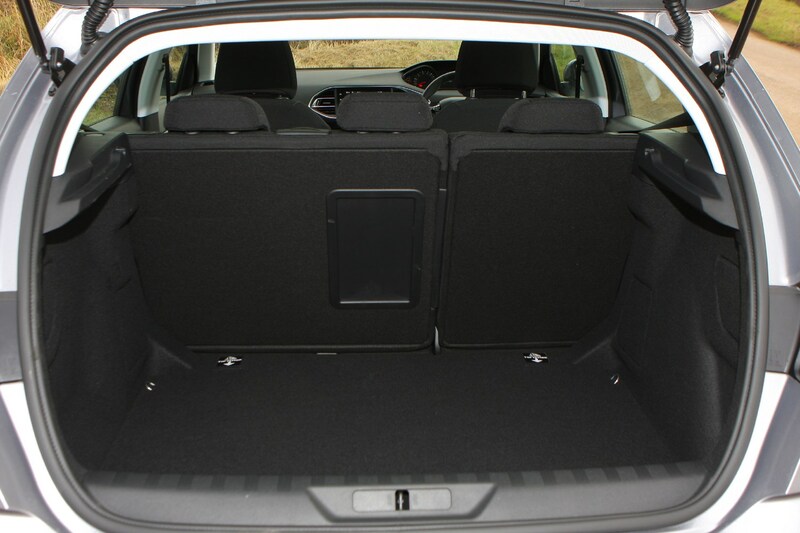 In response to more stringent WLTP emissions testing in the middle of 2018, the GTi 270 was subsequently altered to become the current GTi 260. 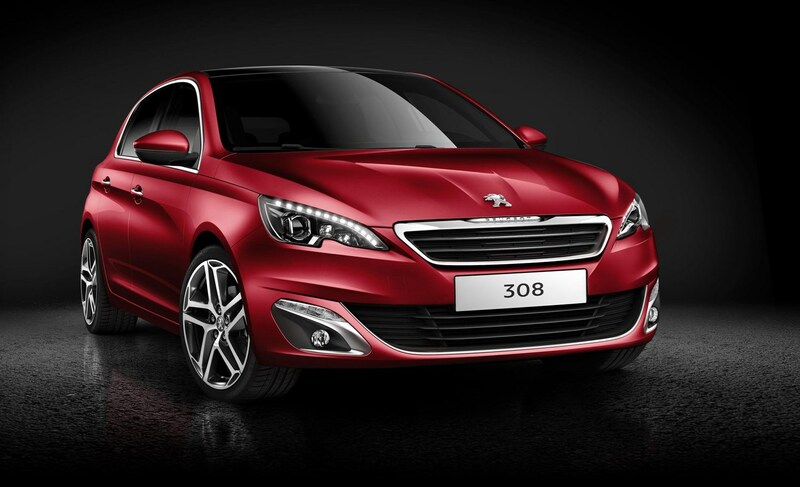 This is the 250hp 308 GTi, powered by a slightly detuned version of the same turbocharged 1.6-litre petrol engine. 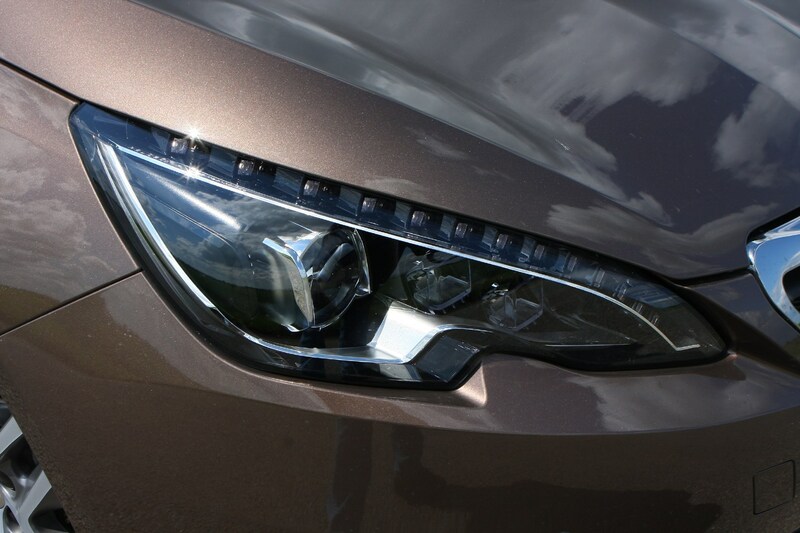 The engine certainly impresses. 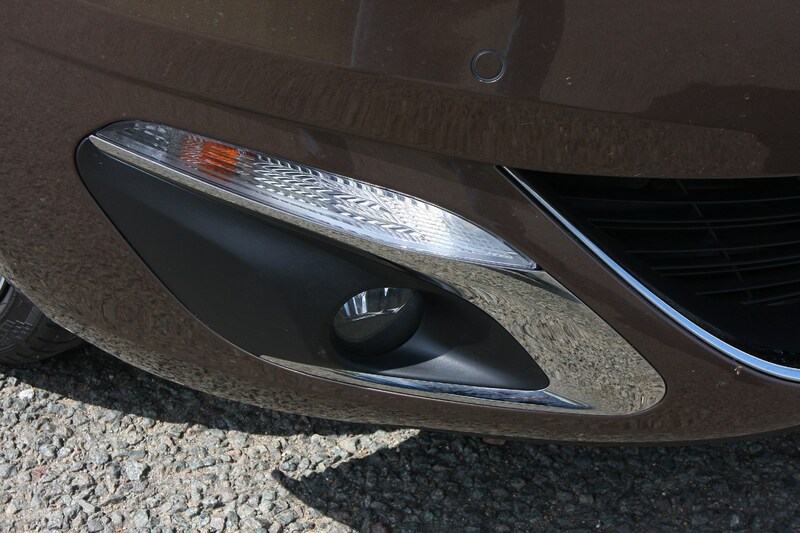 A healthy 330Nm of torque is available from just 1,900rpm, so there’s a real sense of urgency when you floor the throttle – it’ll go 0-62mph in just 6.2 seconds and onto a top speed of 155mph. 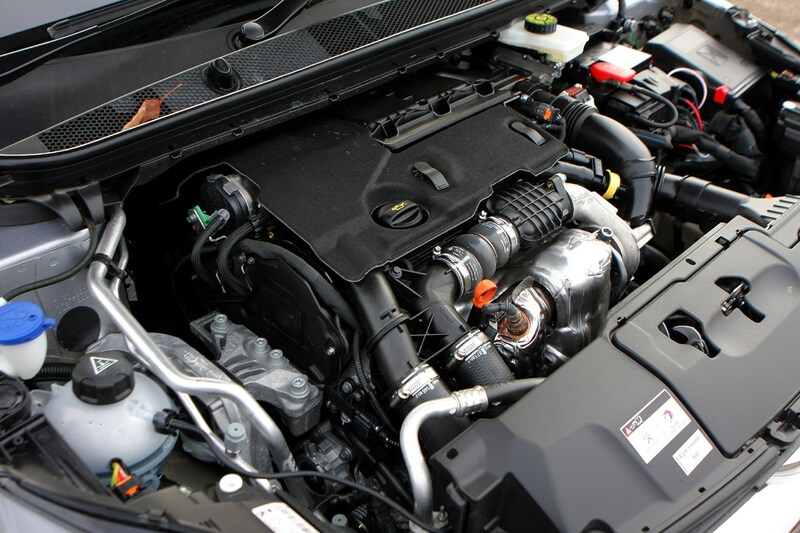 It’s a very flexible engine, too. 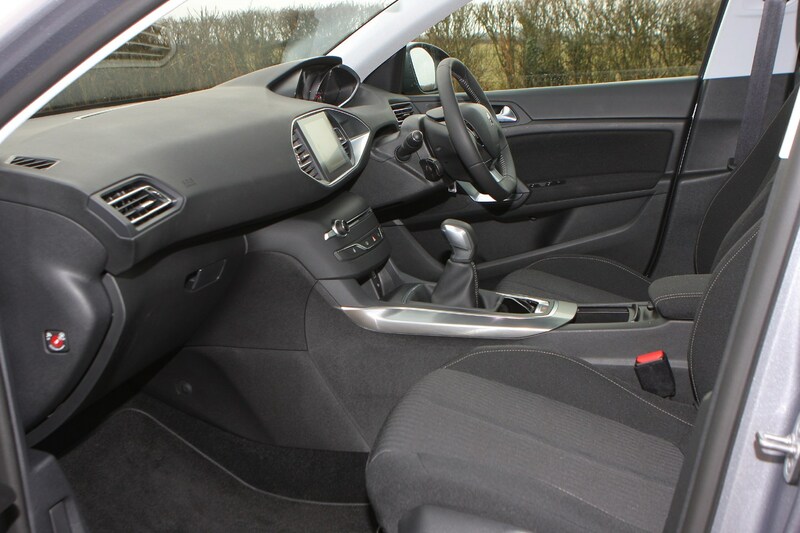 There’s power on tap in all gears and the GTi changes from relaxed motorway cruiser to exciting sports car in an instant. The only thing lacking from the engine is a spine-tingling soundtrack to go with the performance. What you get is more of a dull grumble than wailing engine note. 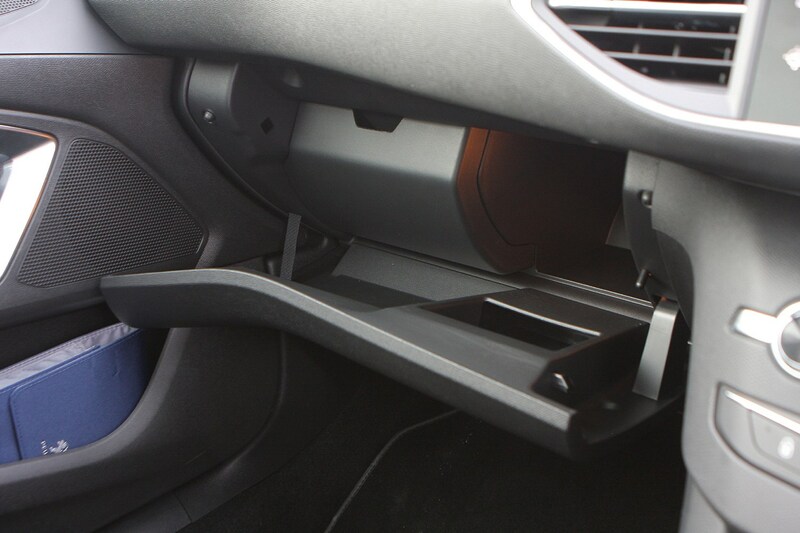 The gearbox is precise, but with quite a long throw it doesn’t feel as engaging as some of its competitors. 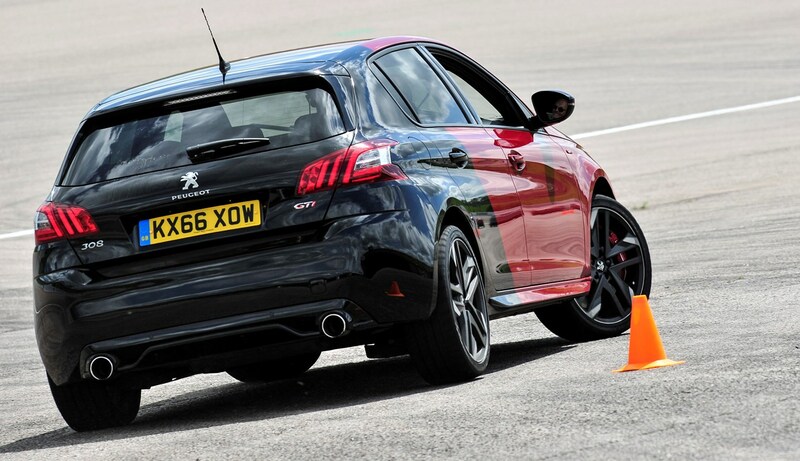 Where the 308 GTi comes alive is in the corners. 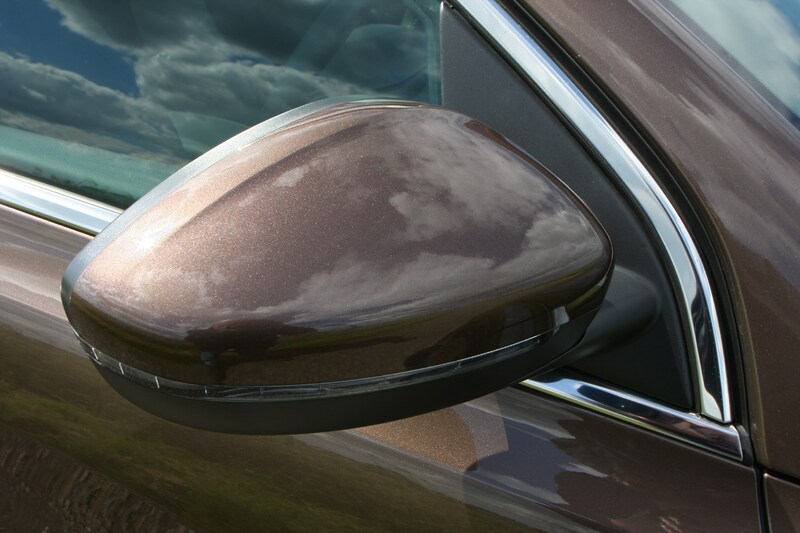 There’s an almost bewildering amount of grip – it takes some real provocation to get it to falter, while body control remains flat in the bends, too. 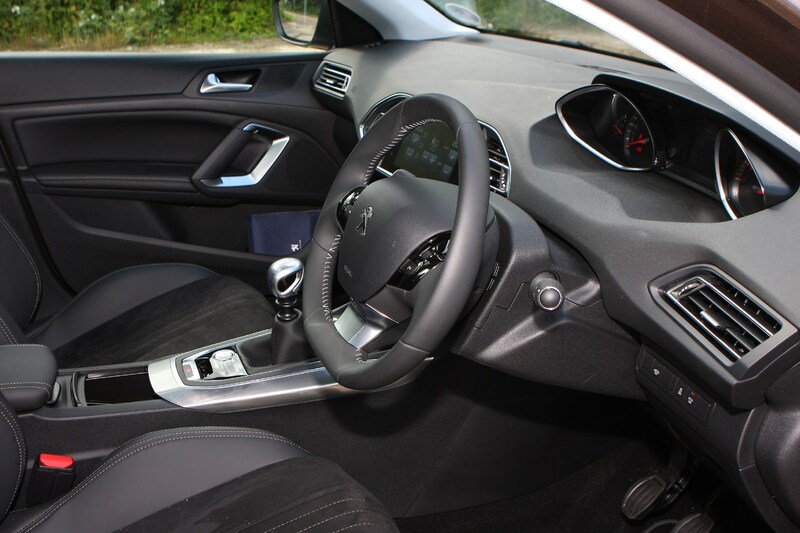 Quick off the mark, the 2.0-litre diesel engine has 150hp on offer and, in this case, is mated to a six-speed automatic gearbox (a six-speed manual is also available). The 0-62mph sprint is achieved in 8.6 seconds, which feels quicker than it sounds, and the auto gearbox and engine work well together, creating seamless gearchanges, except for the odd occasion when the car is warming up. 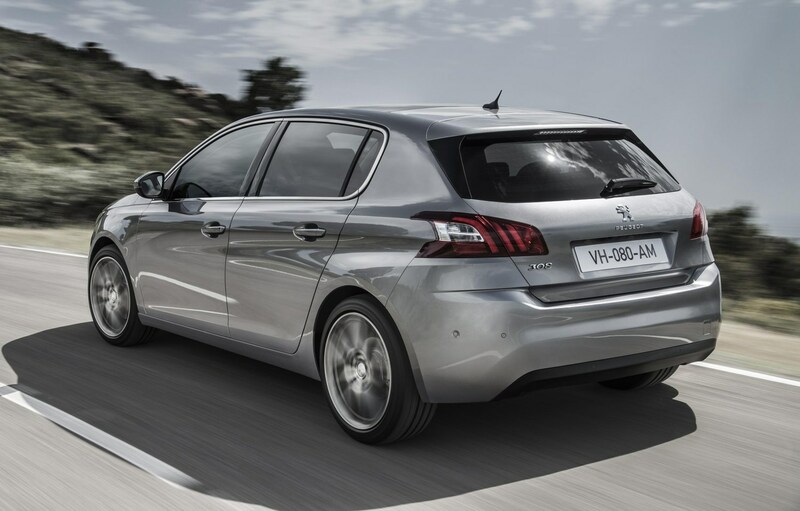 The 308 has shed 140kg over the previous generation and as a result feels light and agile on the road. 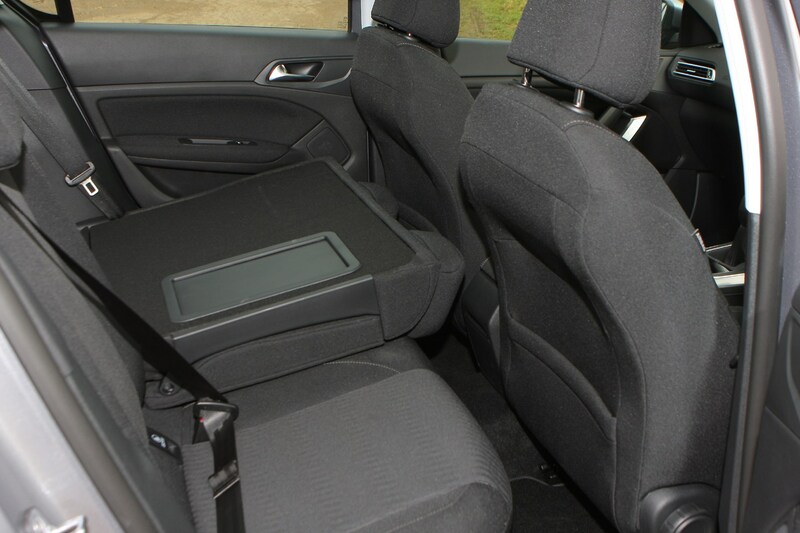 It’s fun to drive, with light steering and manageable body roll in the corners. 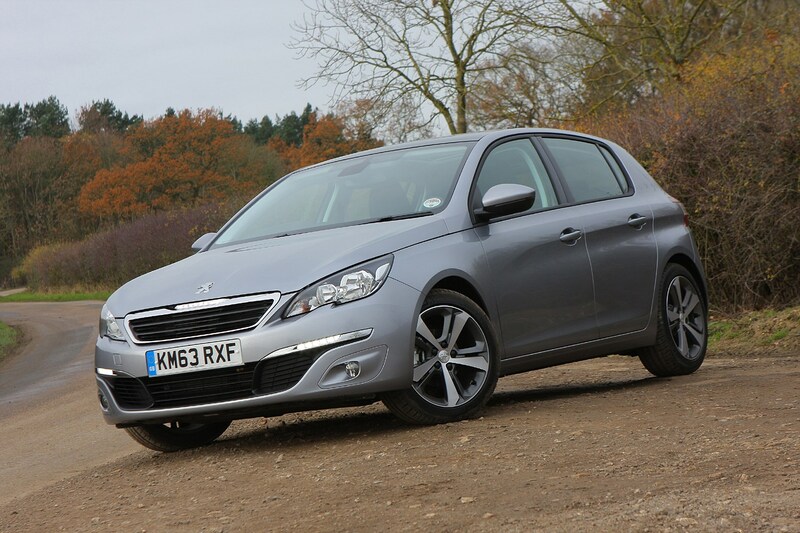 Fuel economy is good too with an official combined figure of 68.9mpg. 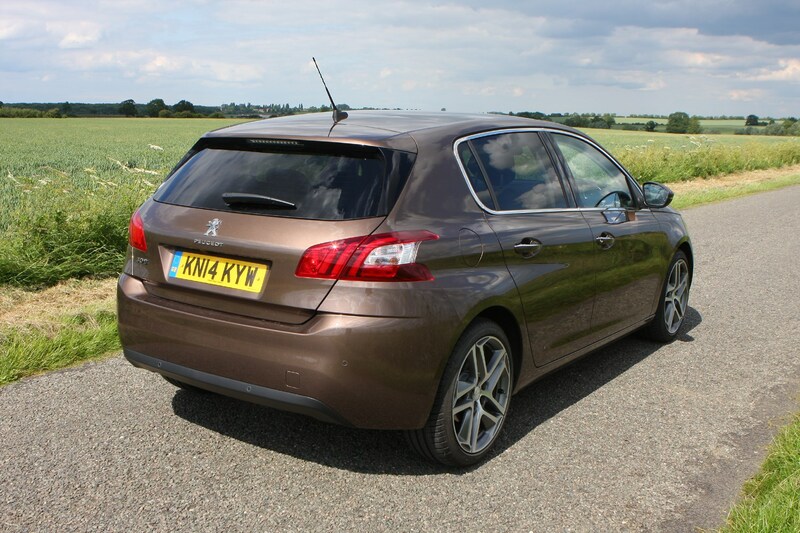 On test we managed around 55mpg in a variety of town and motorway driving which is still impressive. 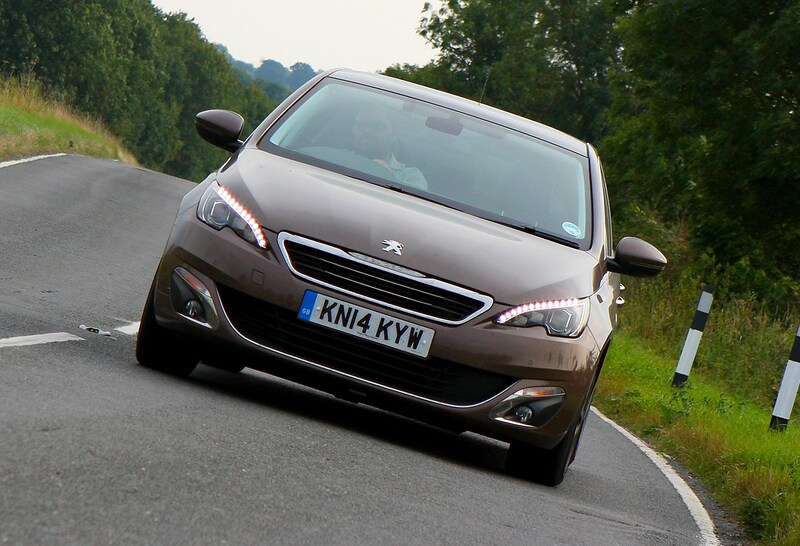 This isn’t the best performing 308 when it comes to CO2 emissions but at 107g/km it’s still impressively green. 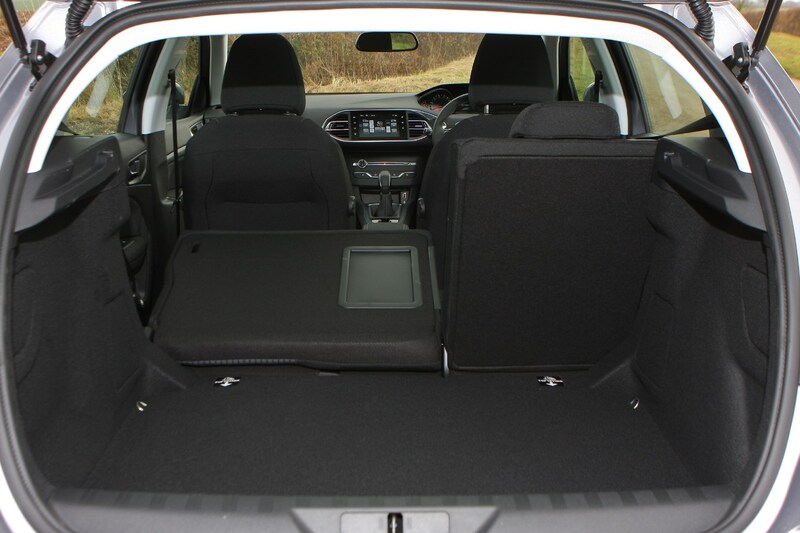 The 1.6-litre BlueHDi with 120hp however emits only 82g/km and is a popular choice for company car drivers. A 308 BlueHDi really does allow customers to have their cake and eat as much of it as they want. 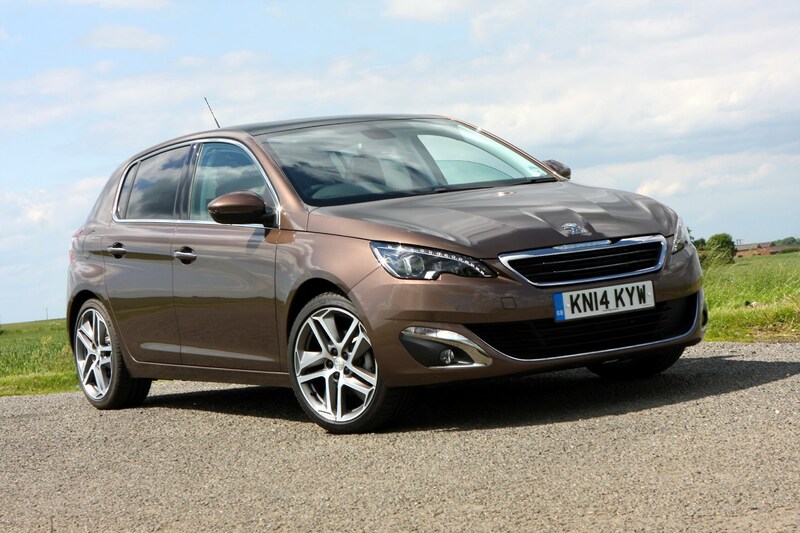 It’s all down to its rich mixture of performance and economy. 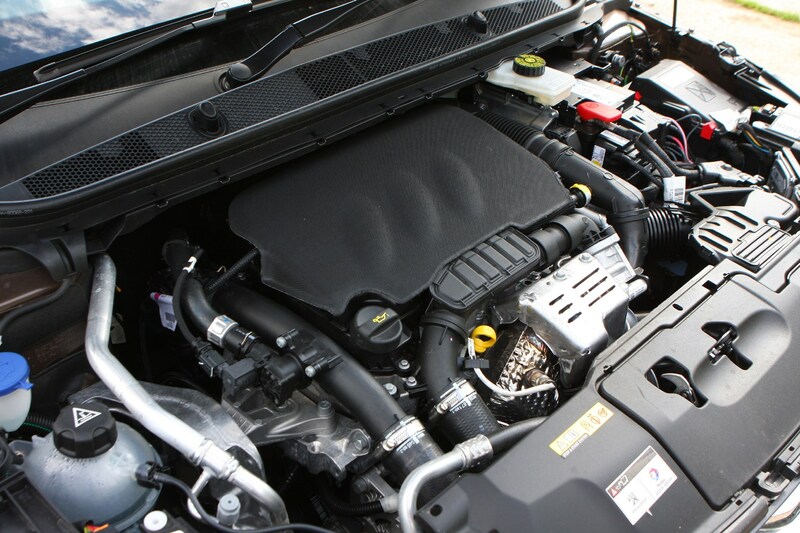 On the one hand this 2.0-litre diesel engine produces 150hp, and 370Nm of torque – the latter on stream from just 2,000rpm – allowing for an official 0-62mph time of just 8.9 seconds and a top speed of 132mph. 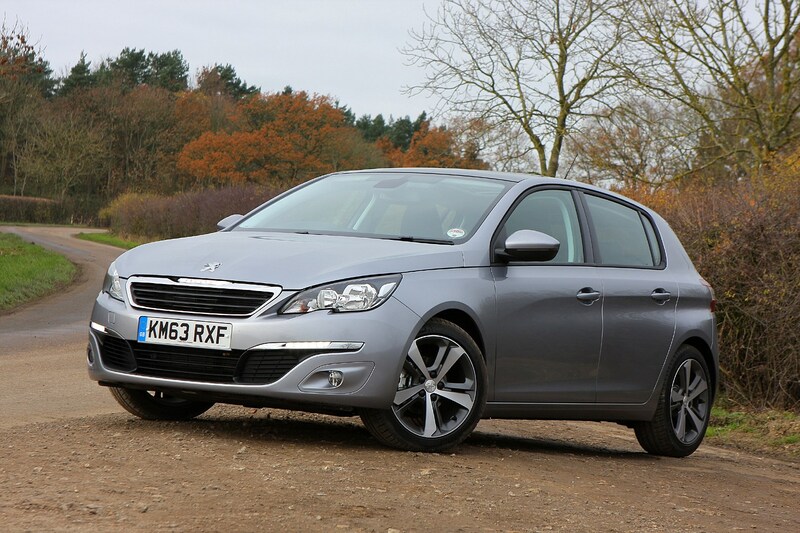 On the other hand, it emits just 105g/km and can return over 70mpg on the combined cycle. 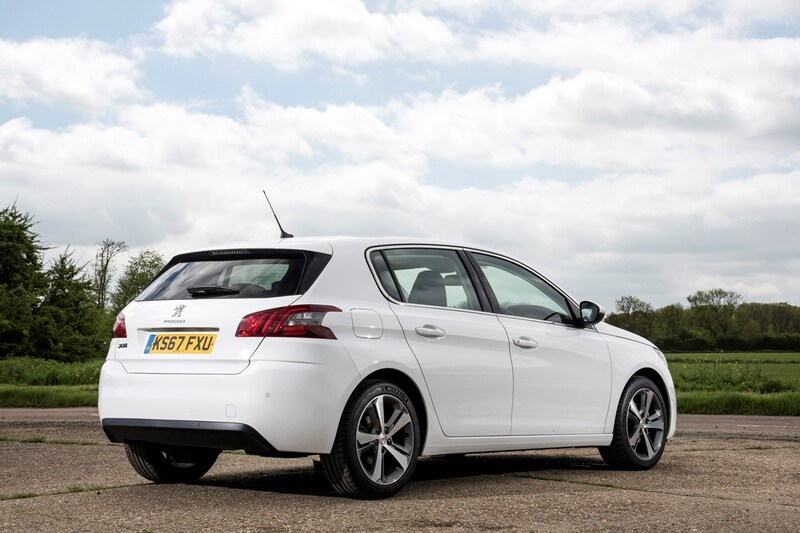 The 308 regularly returned over 50mpg in our hands. 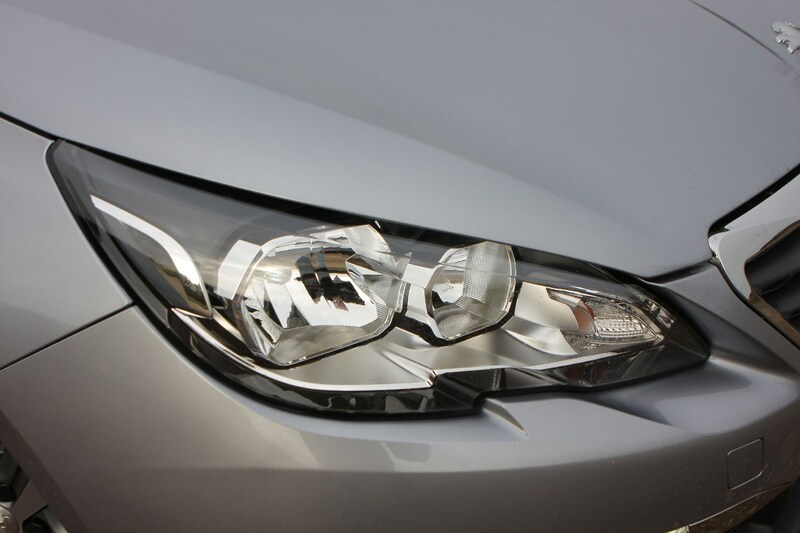 It’s a relatively smooth engine too, while its mid-range punch ensures it always feels pleasantly brisk. 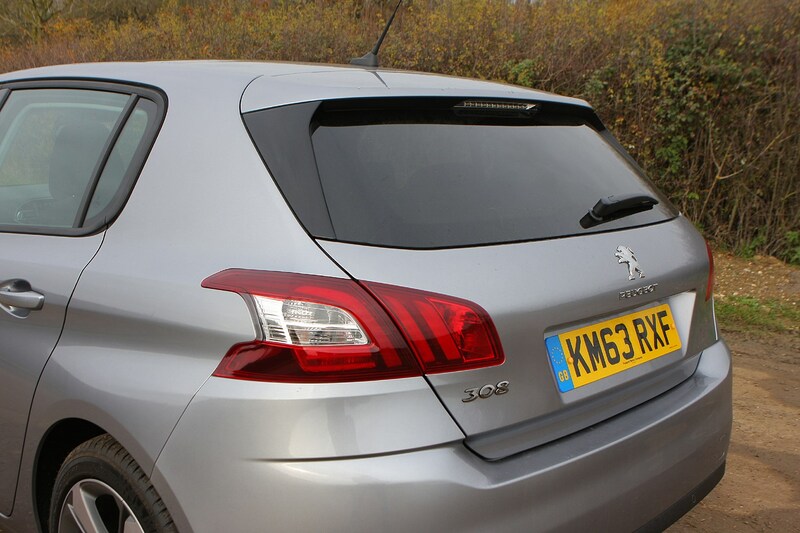 Don’t expect the 308 to drive like a sports car though, despite our Feline model’s standard 18-inch wheels giving that very visual impression, as there’s some body roll in the bends. 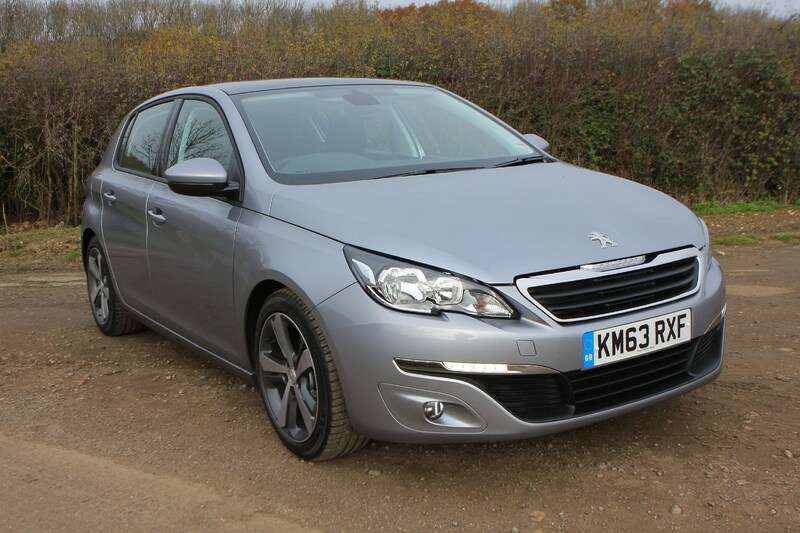 Driven particularly hard it can feel a little ragged, and the Peugeot is far more acceptable at sensible speeds. 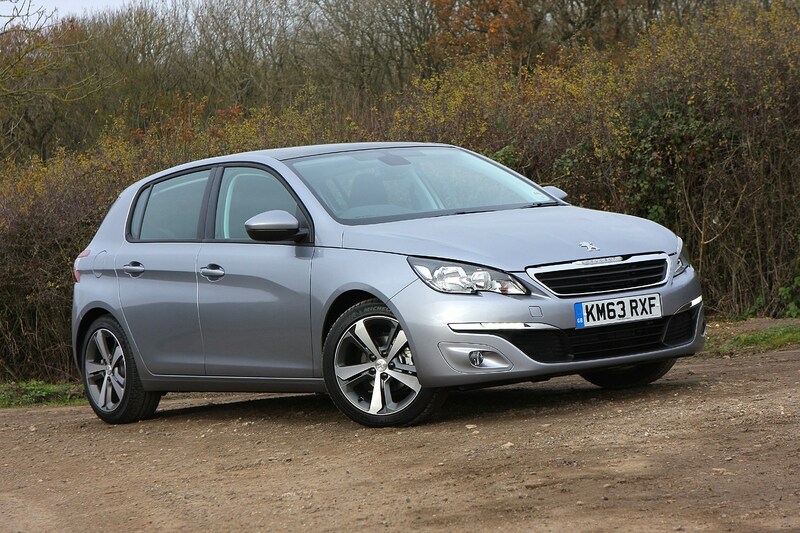 Another area of significant improvement, compared to the previous generation is how the 308 handles. 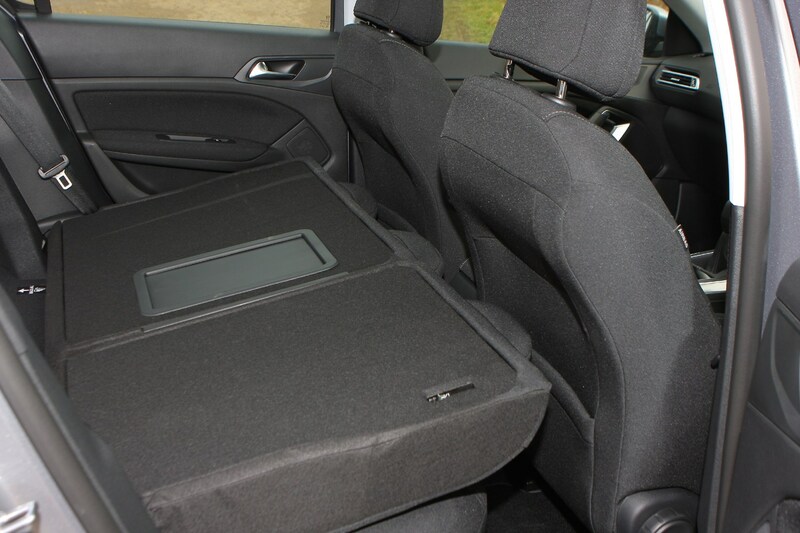 Helping here is a 140kg weight reduction, roughly the equivalent of two passengers, and the car is significantly more agile as a result. 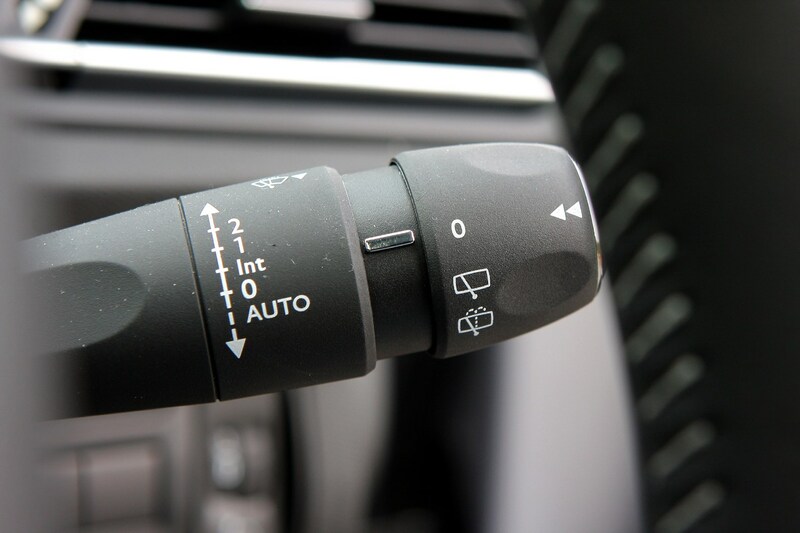 This agility is accentuated by the small steering wheel which requires less turning action to get the car to change direction. 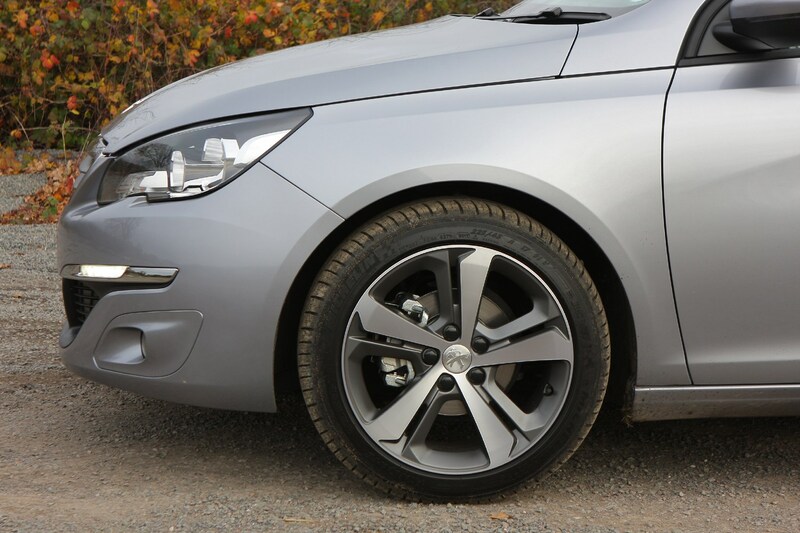 The suspension is also impressive, providing a compliant ride and smoothing out bumpy surfaces without a lot of roll when cornering. 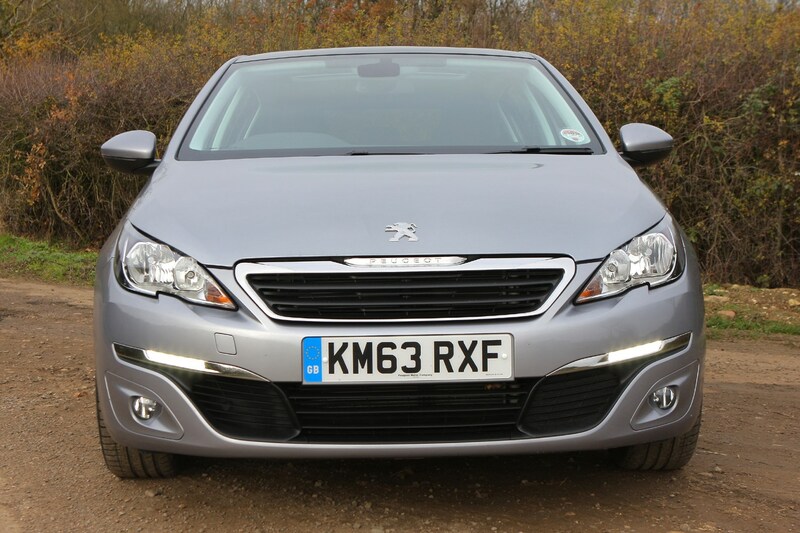 It certainly is a noticeable improvement over the previous-generation 308, though if you prefer a car that is sharper to drive and don’t mind a harder ride there are other cars that can deliver that. What also impressed was hard braking while turning into a corner, which did not upset the car and we always felt very much in control. 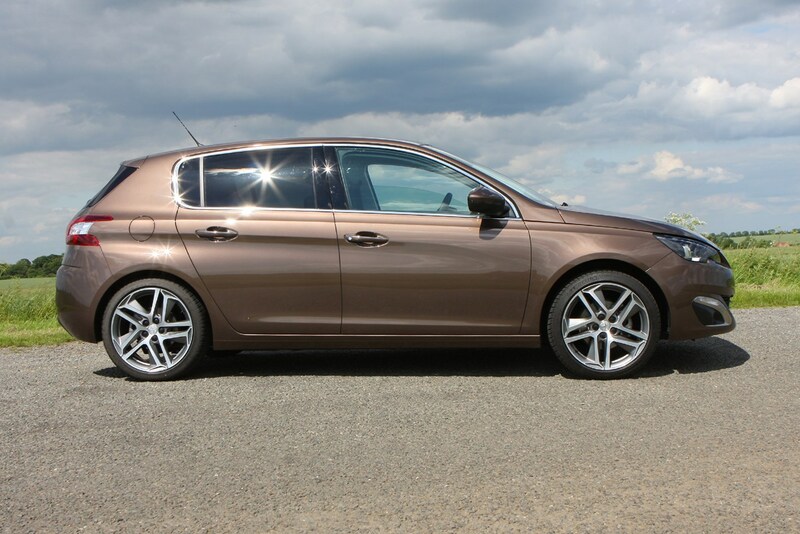 For the ultimate in Peugeot 308 handling prowess you’ll want the full-fat GTi 260 by Peugeot Sport. 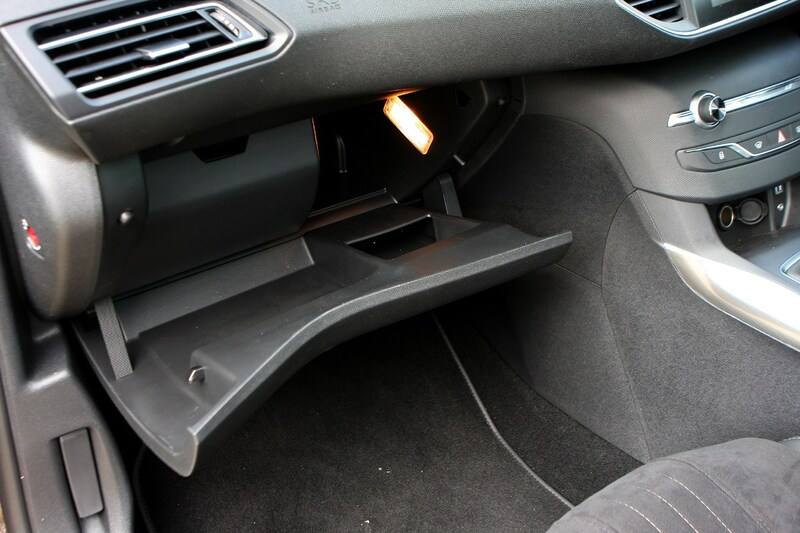 This car features more substantial brakes and a mechanical differential, which helps get as much of that power down on the asphalt as possible. 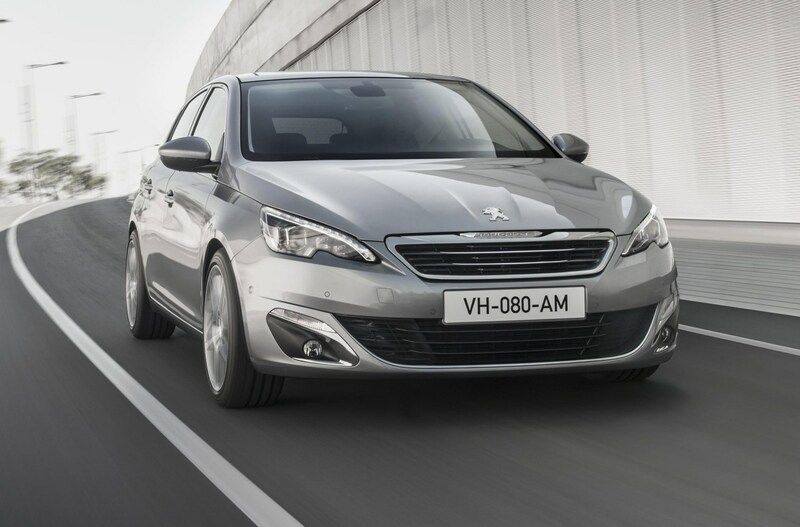 It’s this that comes to define the way the 308 handles – you pitch the front end into a corner using the fast, reactive steering and the tyres grip hard, allowing the car to hold its line with confidence. The steering takes a little getting used to though. 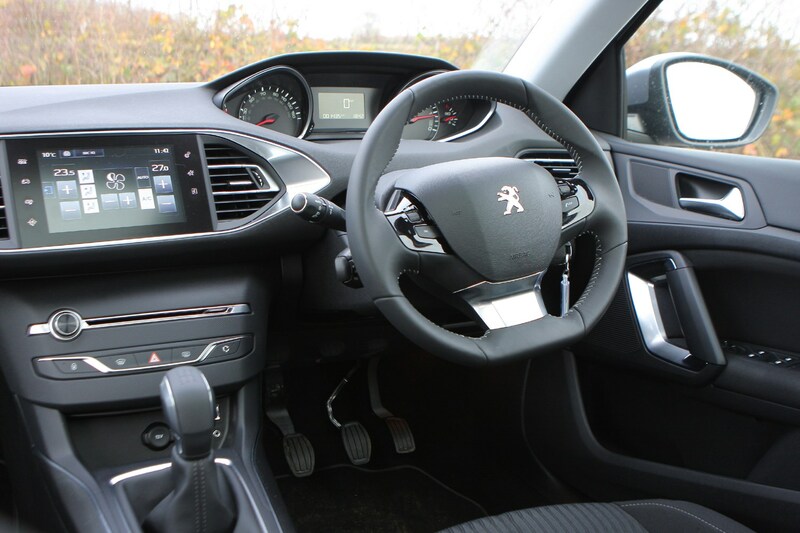 The feeling through the wheel isn’t entirely natural as the diff tends to tug both your hands and the nose of the car left and right under power, but these aggressive, mechanical sensations are all part of the experience. 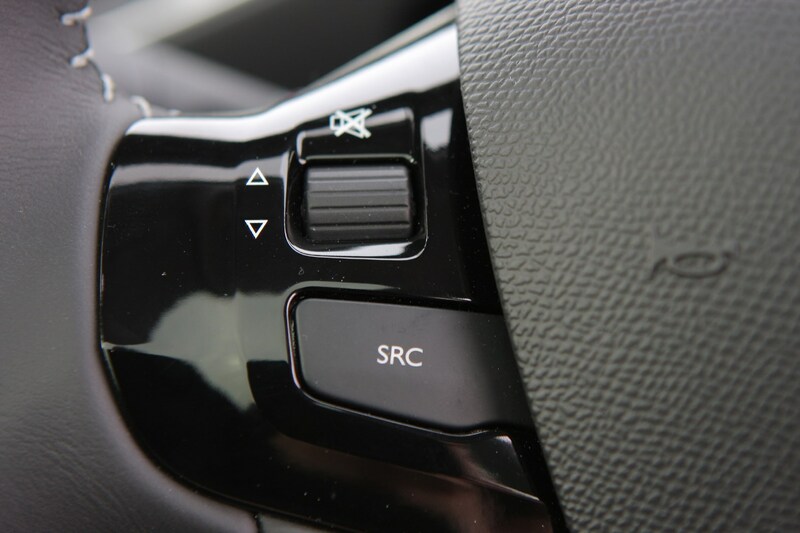 It’s very direct, but the combination of this and the small steering wheel means you’ll find yourself turning into a corner a bit too hot until you get used to the set-up. 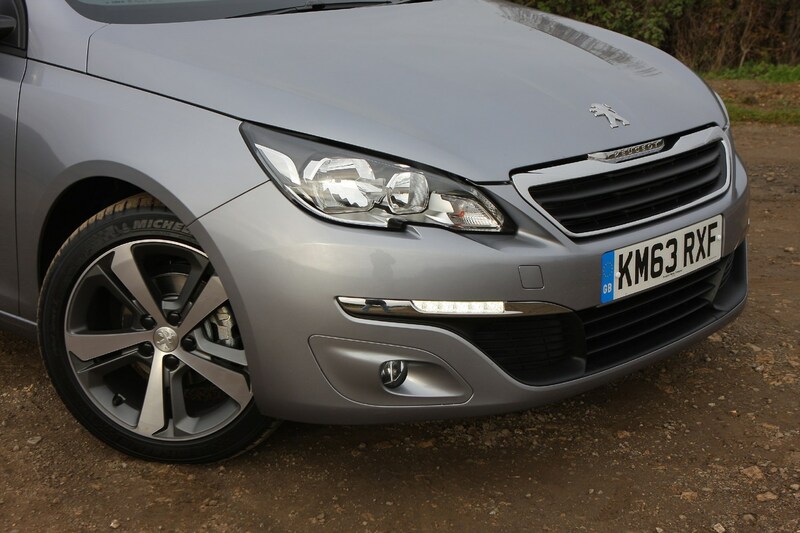 Once you’ve mastered it though, you’re rewarded with a nimble-feeling car that makes very swift progress. 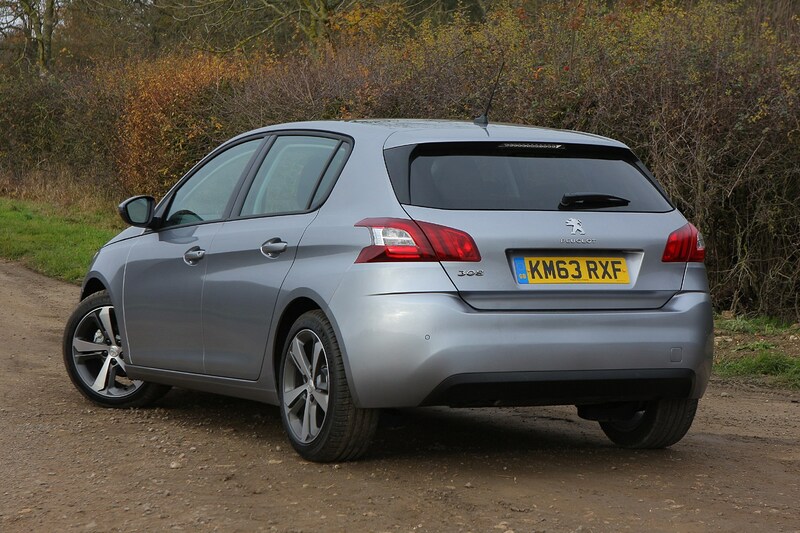 When you don’t want to be pushing on, the 308 stays true to its sensible hatchback roots with a pretty relaxed ride, despite being 11mm lower than the regular 308. 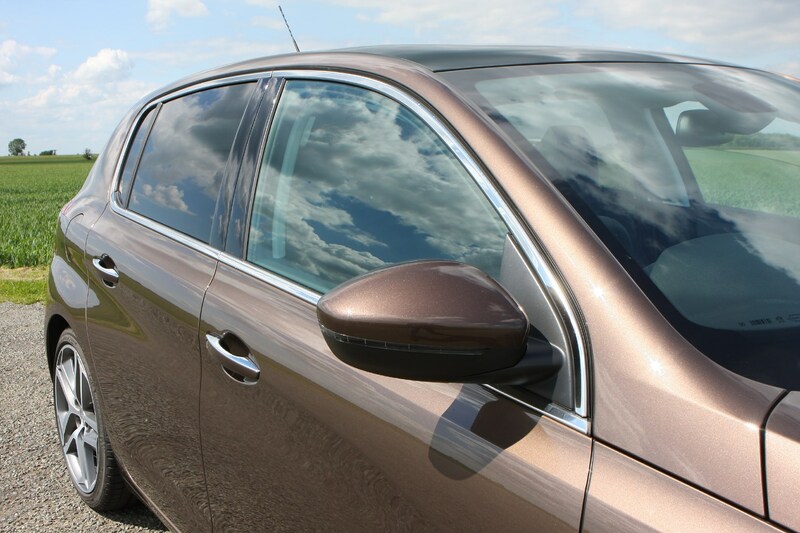 The 19-inch alloys make the ride a little jittery over rough surfaces, but overall things remain bearable and there’s not much wind, road or engine noise to contend with. 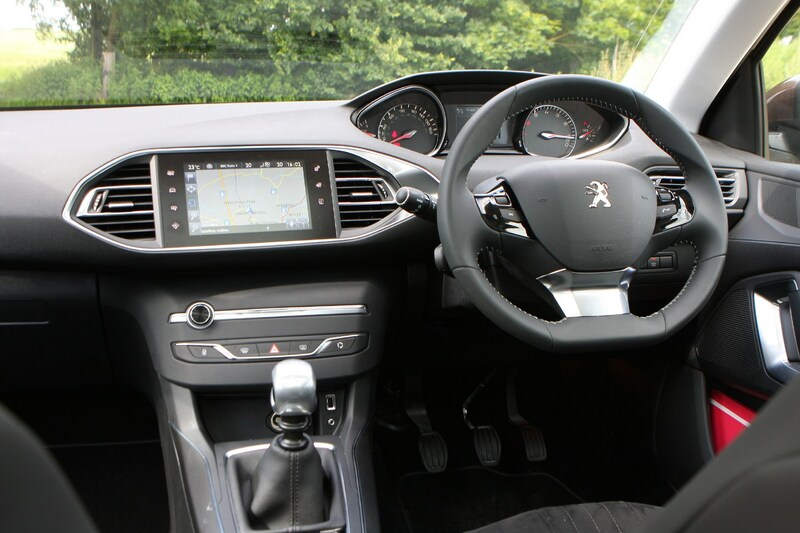 Two things strike you immediately when you nestle into the 308’s driver’s seat: the small steering wheel and minimalist dash layout. 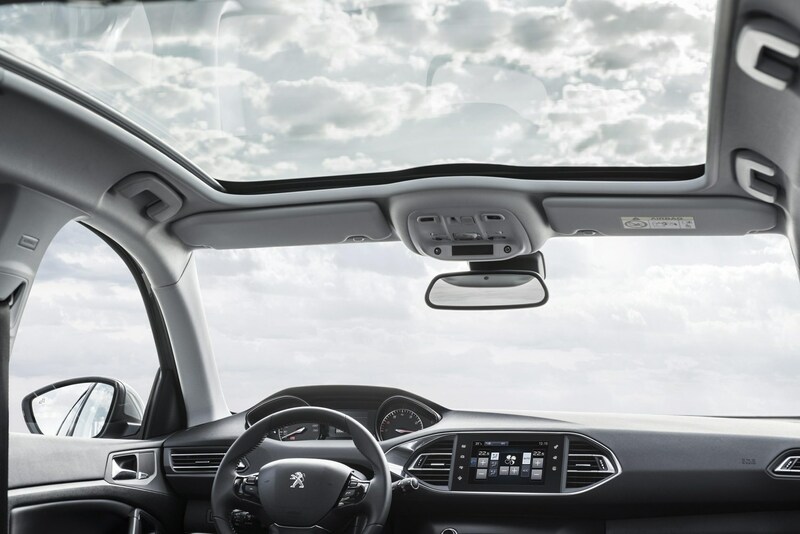 It feels strange at first but we find it not only refreshingly different but it helps you to enjoy the driving experience all the more for the direct steering. 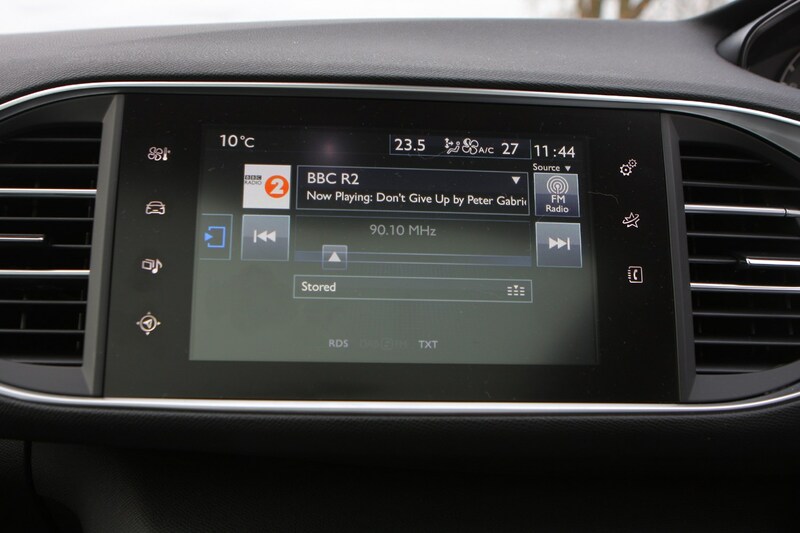 The touchscreen is fiddly to use while driving – and a little slow to respond on earlier cars – and since it takes a while to find the function (air-con, sat-nav, audio) we're after, having some physical buttons and knobs would make it easier. 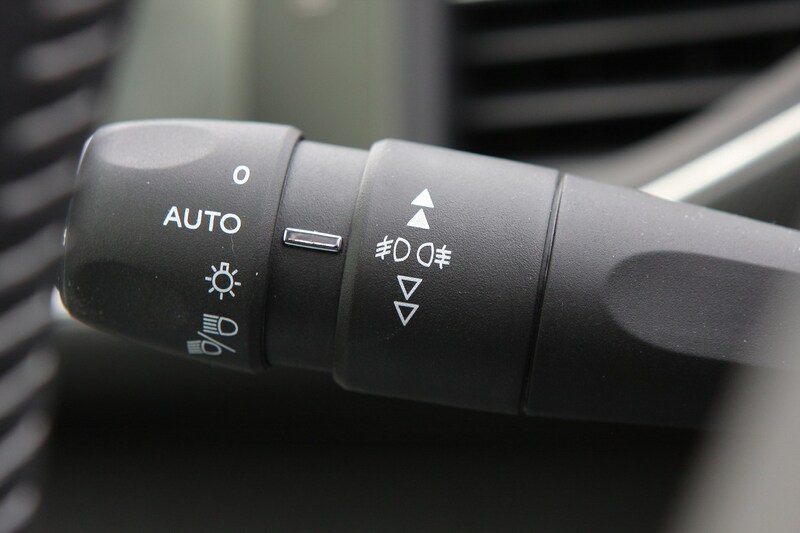 Similarly, the unusual driving position won’t suit everyone – some people find it off-putting looking over the wheel to see the speedo and anticlockwise-sweeping rev counter. 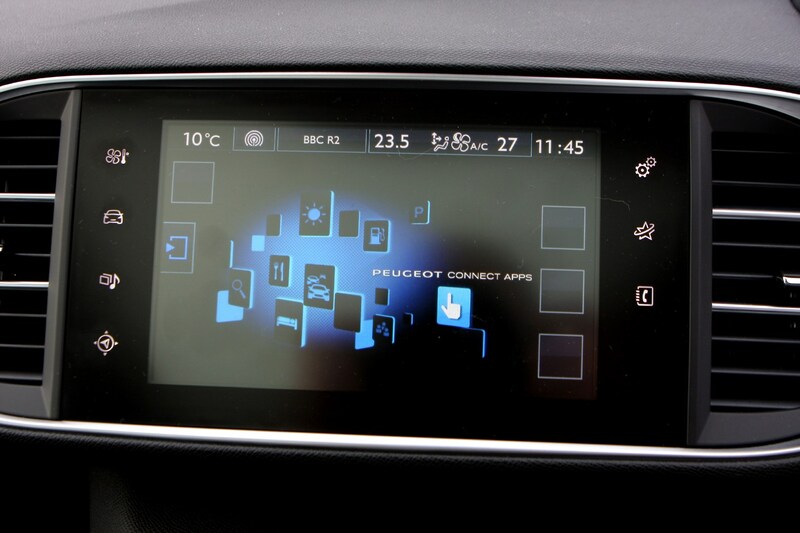 Updates in 2017 brought a more responsive screen, which helps to cut down the number of frustrating jabs and missed button pushes. 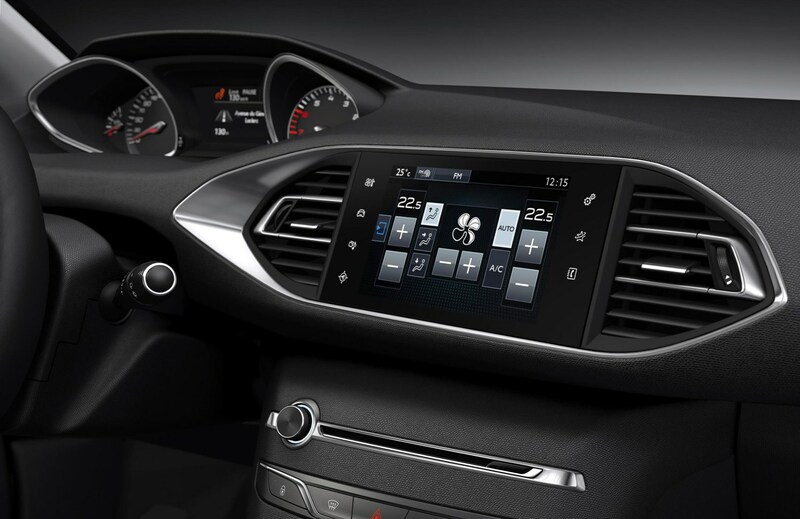 We hoped the facelifted 308 might have adopted the 3008’s (slightly) increased number of physical switches but the majority of the controls remain virtual. 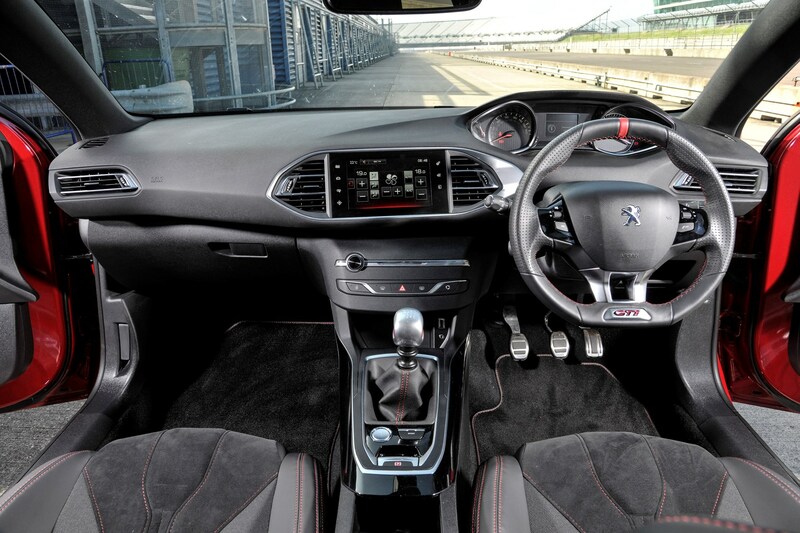 The main addition for the sportiest 308 is yards of red detailing – with stitching on the seats, door cards, gearshift gaiter and floor mats. 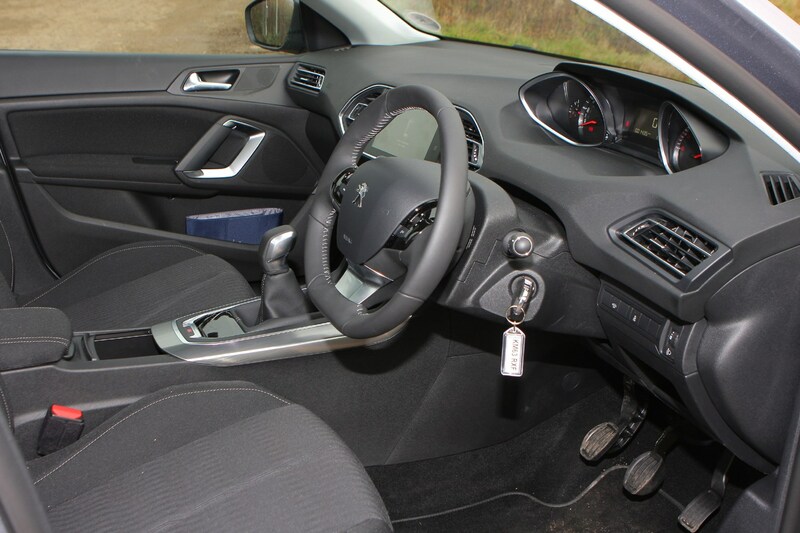 There's a red strip on the steering wheel, too. 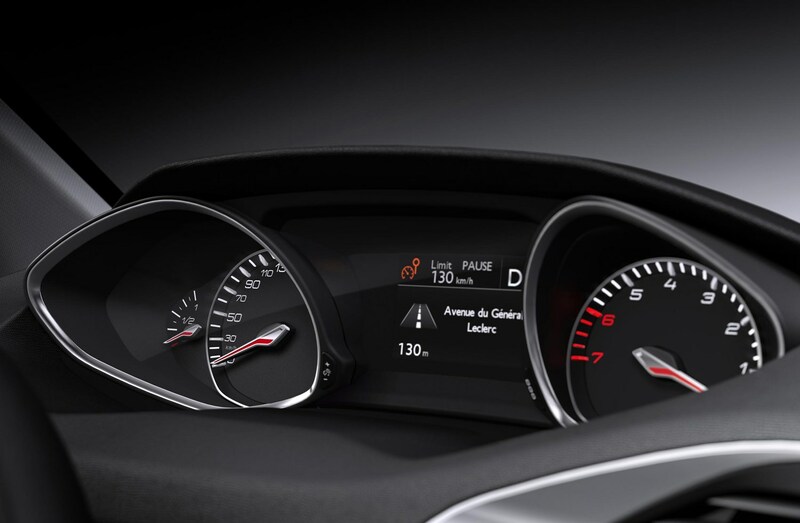 Switching to sport mode makes the instrument panel and dash elements go red, and also unlocks the facility to show power, turbocharger boost and torque output in real-time. 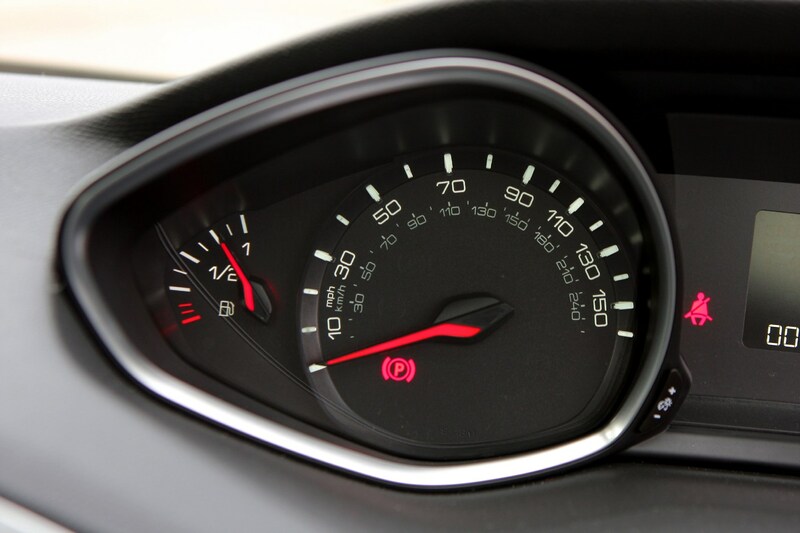 There’s a G-force meter too, so you can see how much grip the car is generating while cornering quickly. 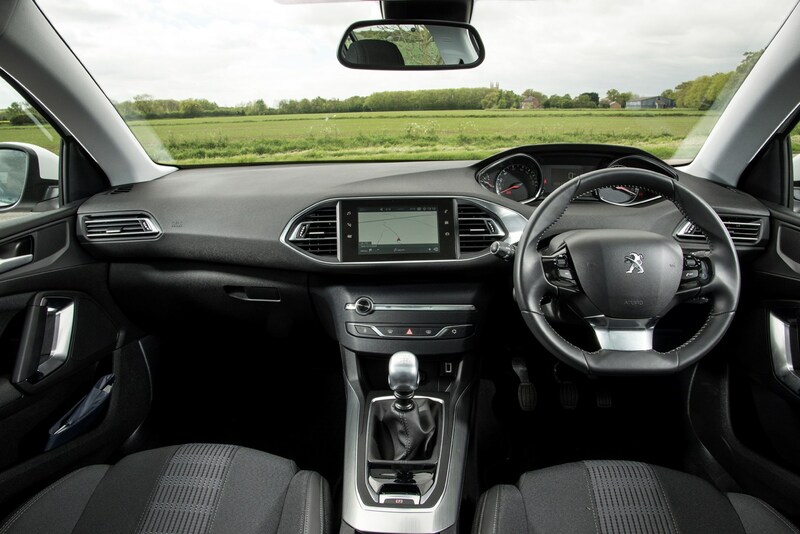 We were impressed by the Peugeot 308 in terms of comfort, whether stuck in a traffic jam or tackling a non-stop three-hour drive to the airport. 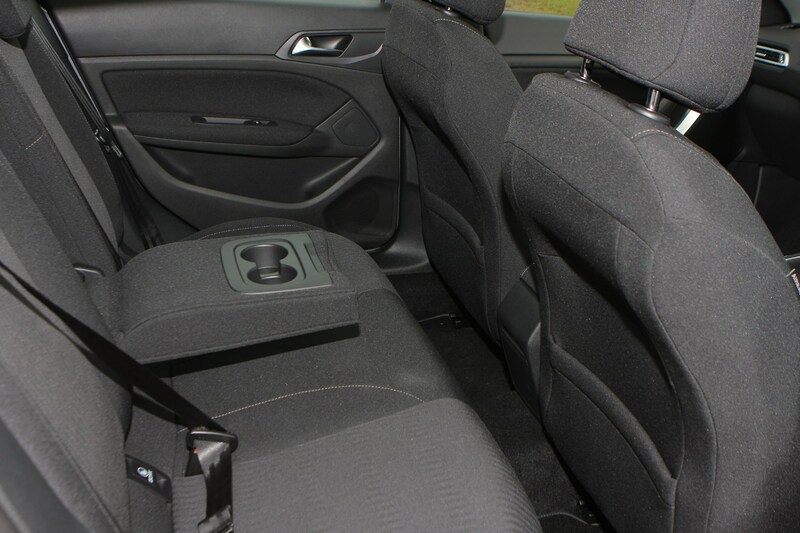 Front seats come with manual adjustment (there is the option of electrically powered control) and the steering wheel is adjustable for both rake and reach, so that enabled us to find a comfortable position easily. 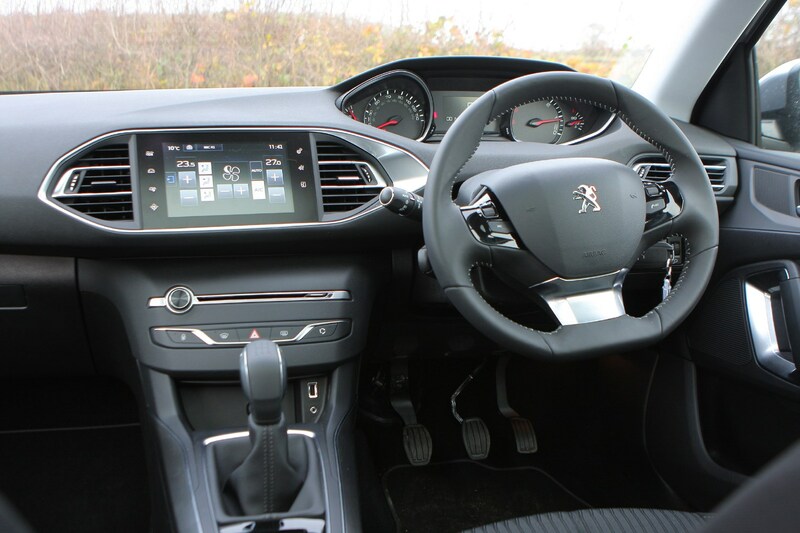 The unusually small diameter steering wheel and position does feel odd at first, but you quickly get used to it and the sensation of a sharpened-up response is very enjoyable. 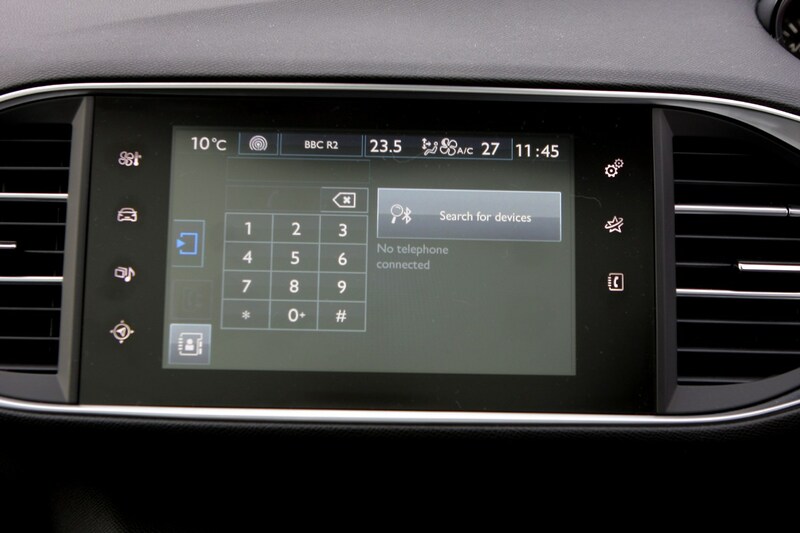 The centrally-mounted screen in the dash is also angled towards the driver making it even easier to read. 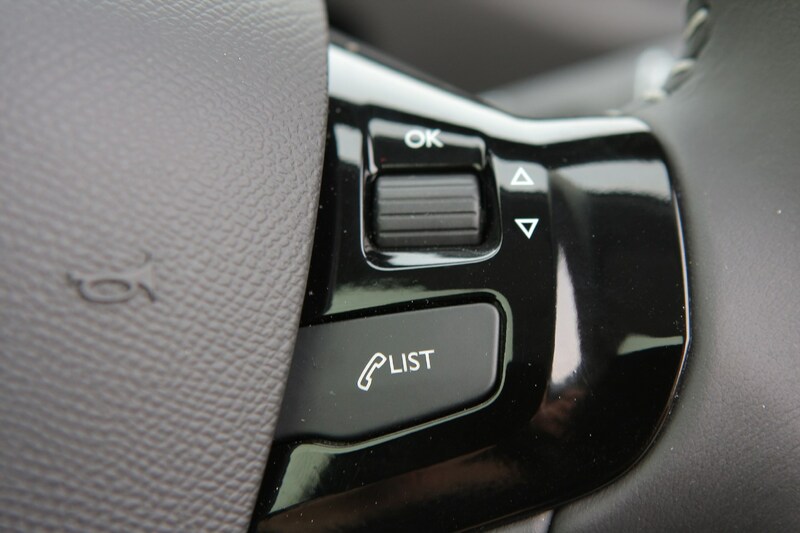 Also because the touchscreen controls the car’s central functions there are very few buttons visible, so no clutter to tire the eyes as you search for the control you are after. 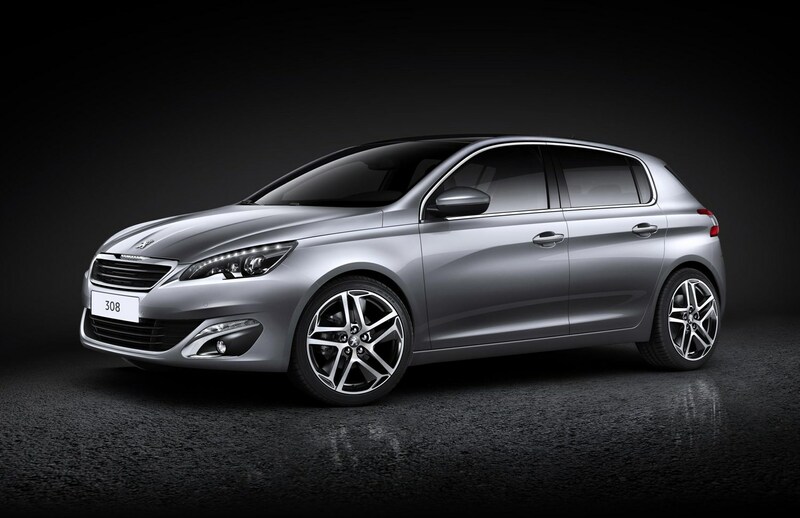 Peugeot has also provided a great compromise between ride comfort and handling. Over rough, city roads the suspension does a good job of absorbing the dips and bumps, and only the very large potholes deliver a hard knock to the car. 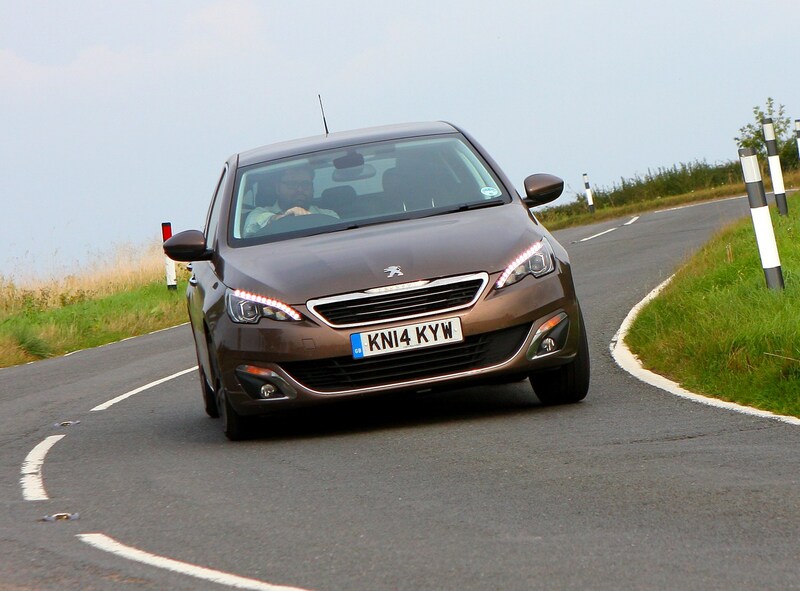 Out on twisty roads enthusiastic cornering has the car turning with alacrity and holding a steady line through a bend, even at speed. A few differences to note in terms of comfort here. 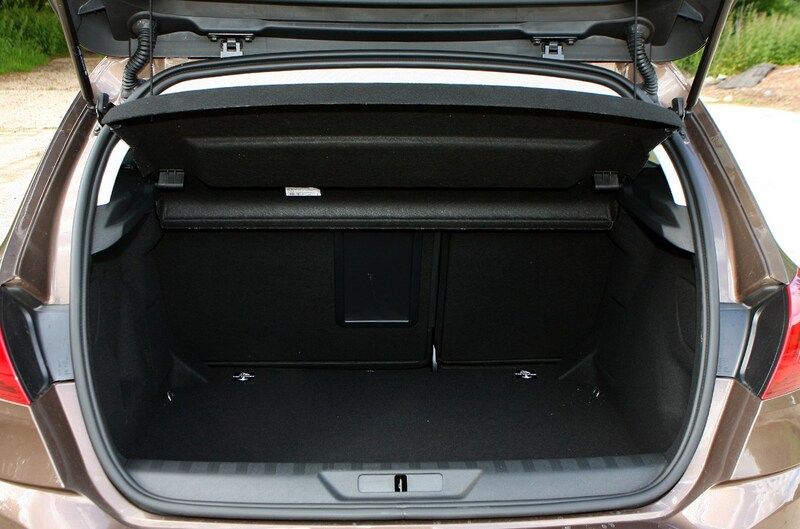 The GTi features suspension lowered by 11mm and bigger wheels than the mainstream 308, but it still rides well, leaning more towards cornering performance than outright comfort. 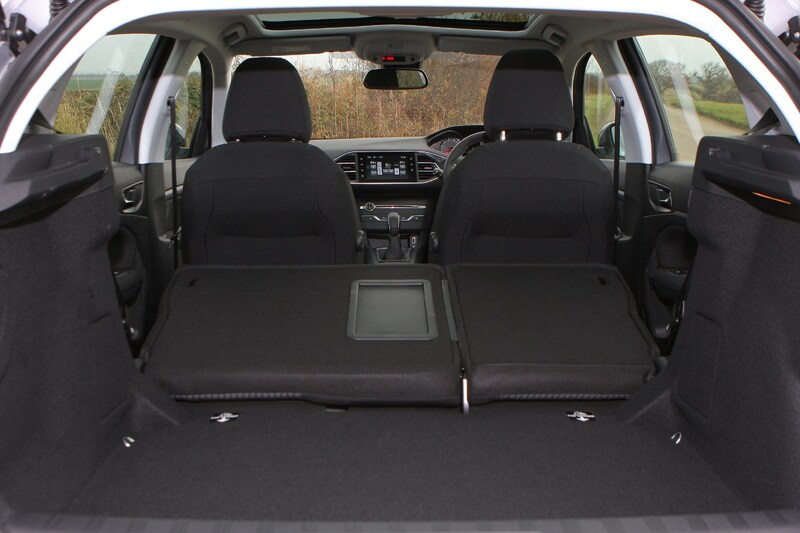 The front sports seats provide extra side support for cornering and feature a massage function for added comfort on longer journeys. 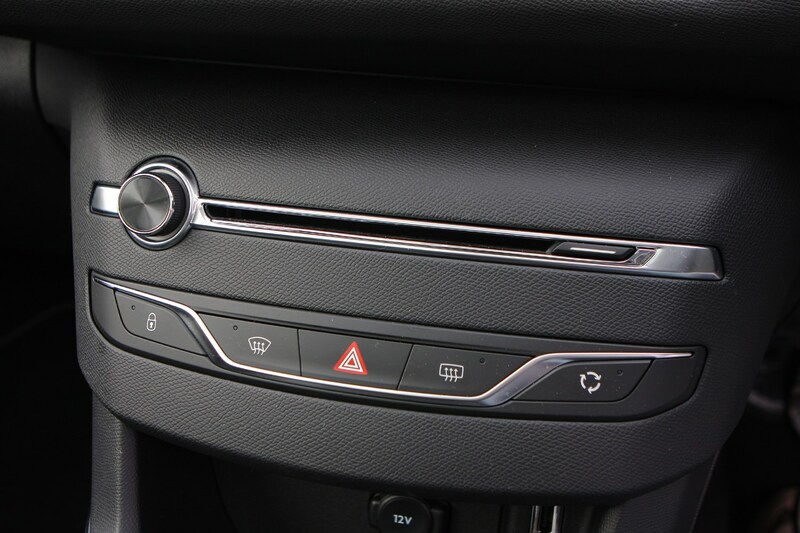 A synthesised engine noise is played through the speakers in the car when you press the sport button too although it’s quite loud and can sound odd to some.